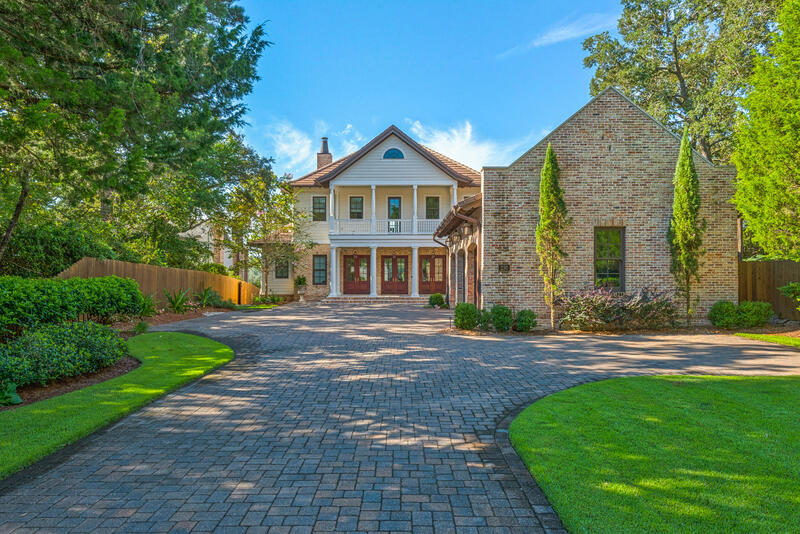 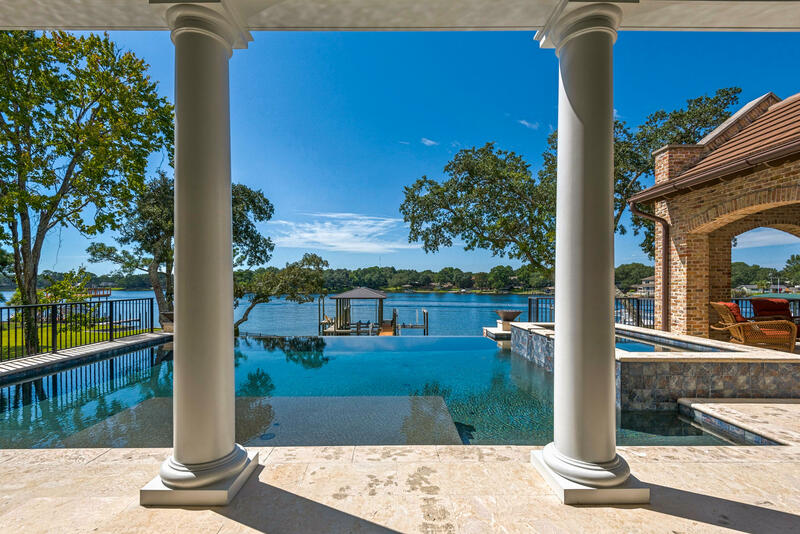 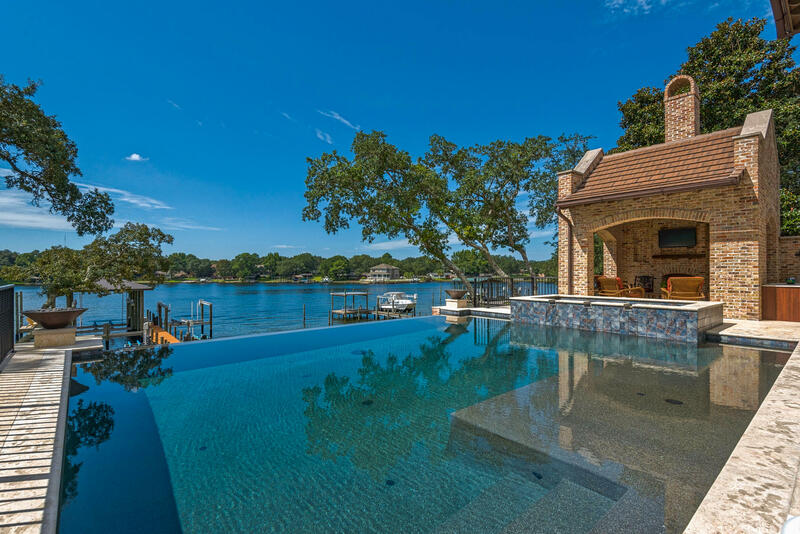 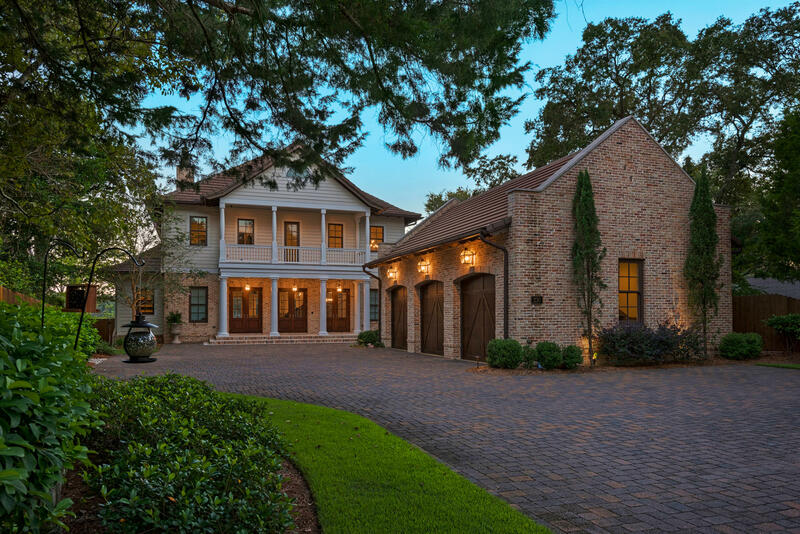 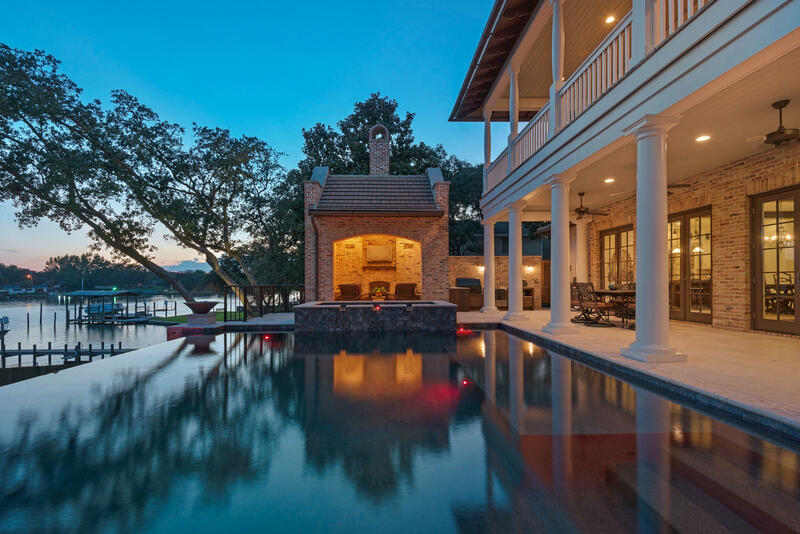 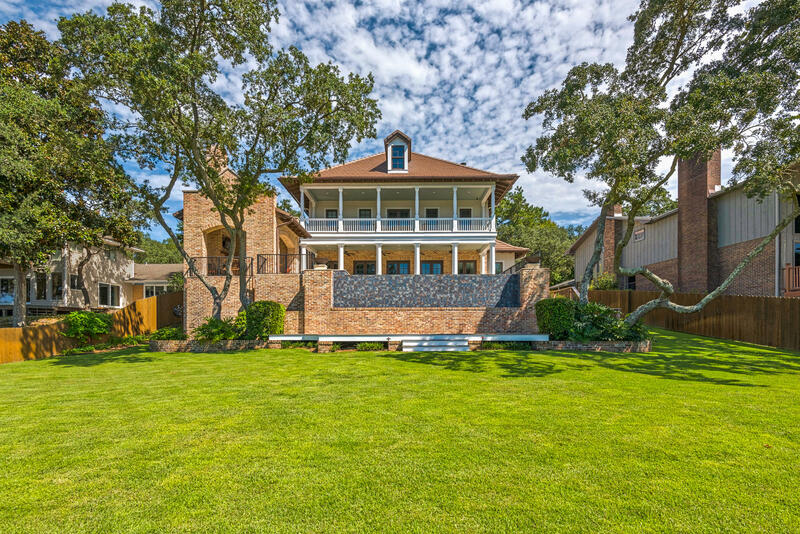 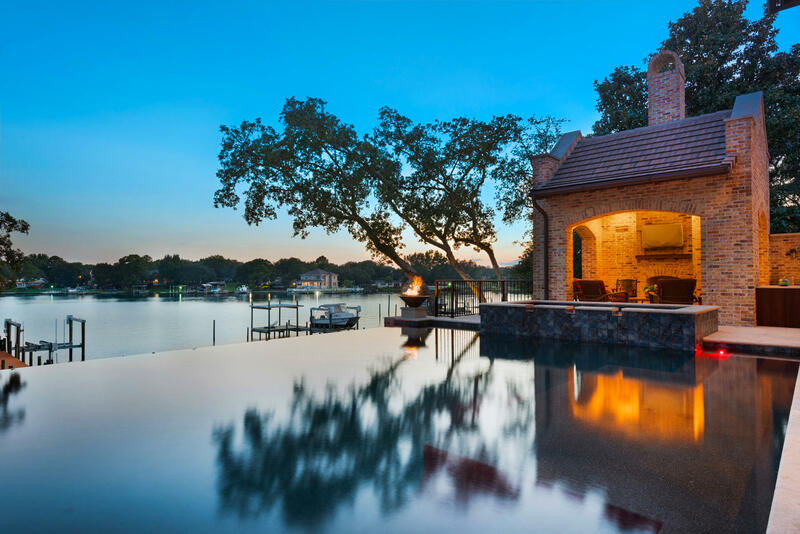 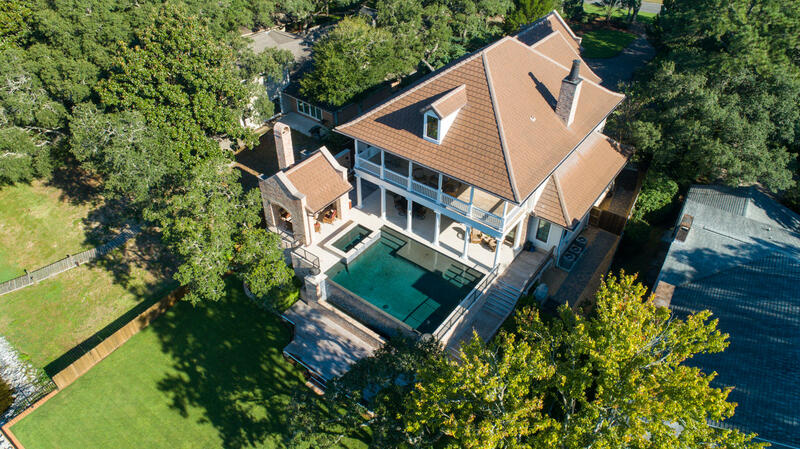 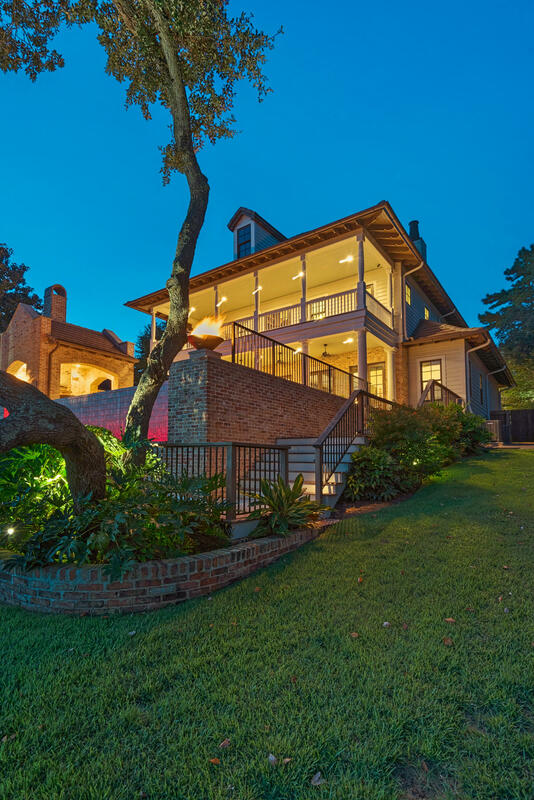 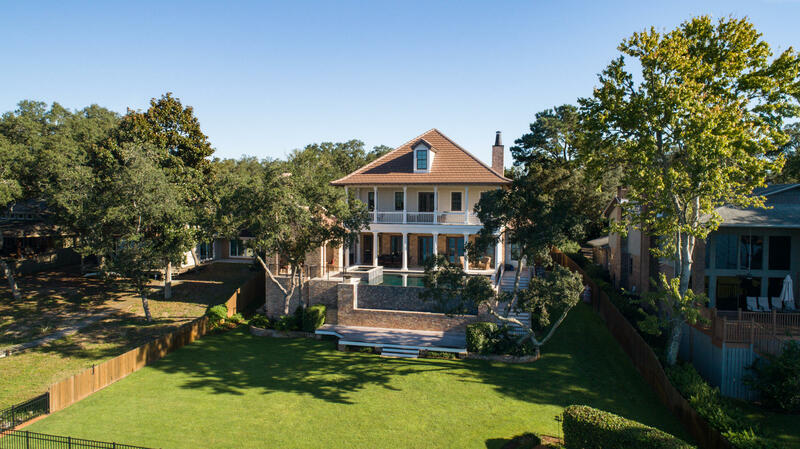 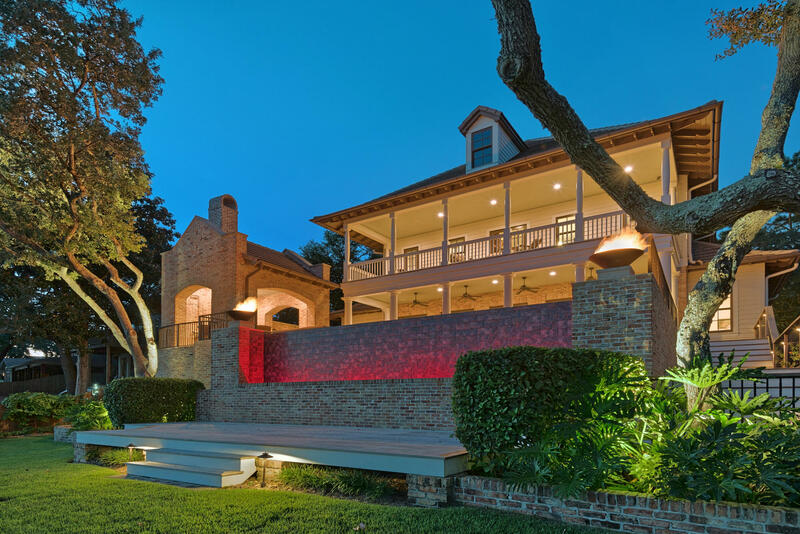 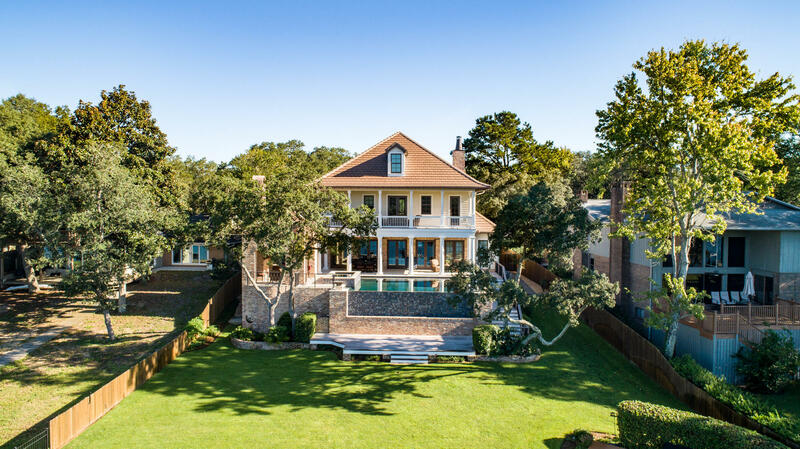 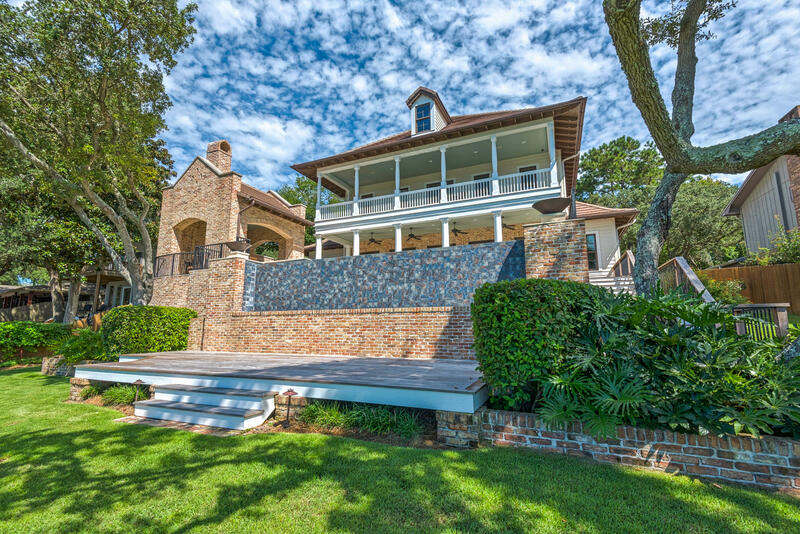 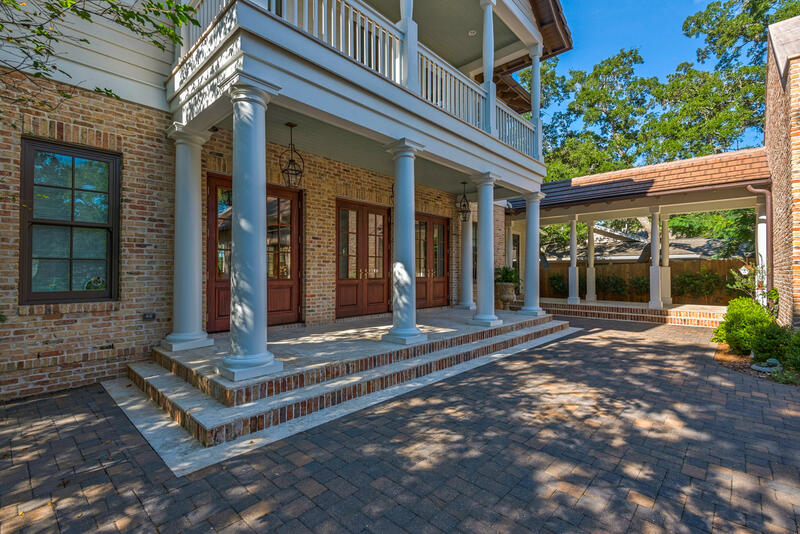 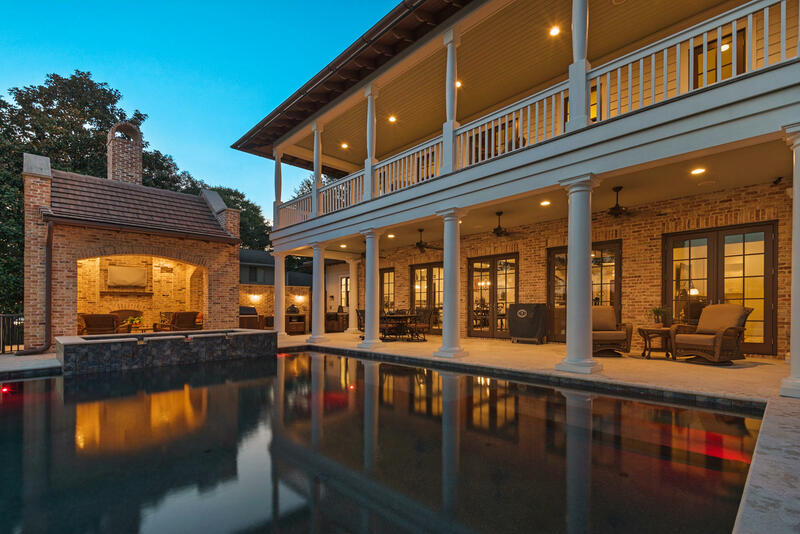 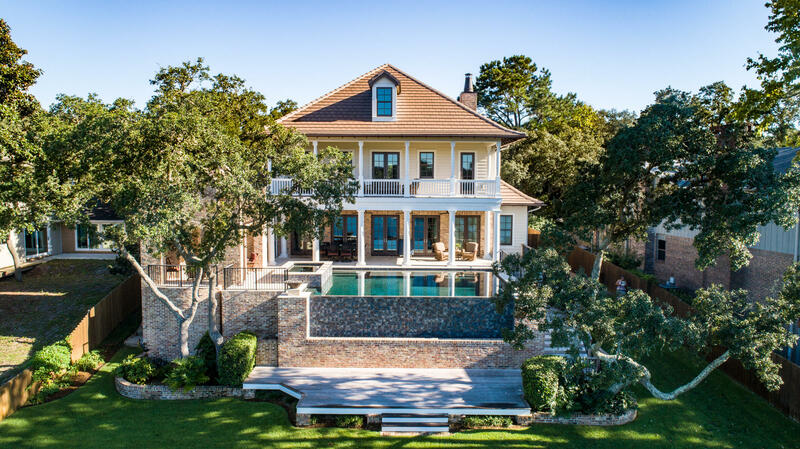 WATERFRONT ARCHITECTURAL MASTERPIECE! 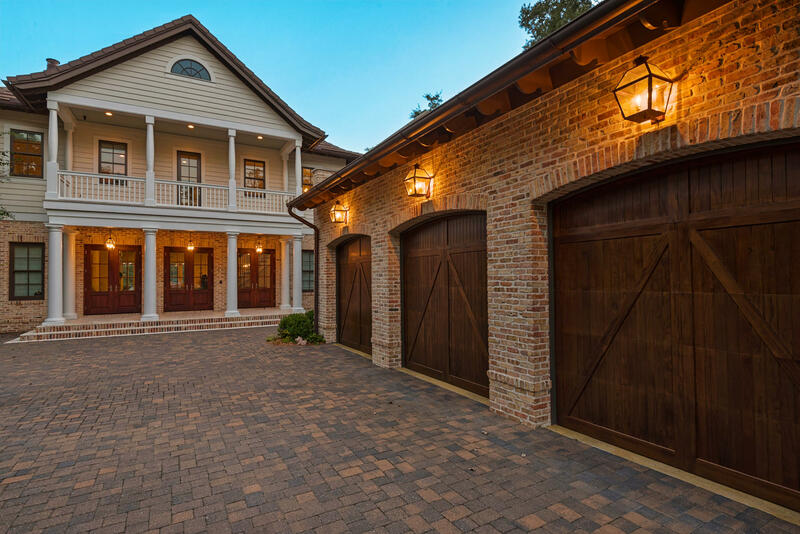 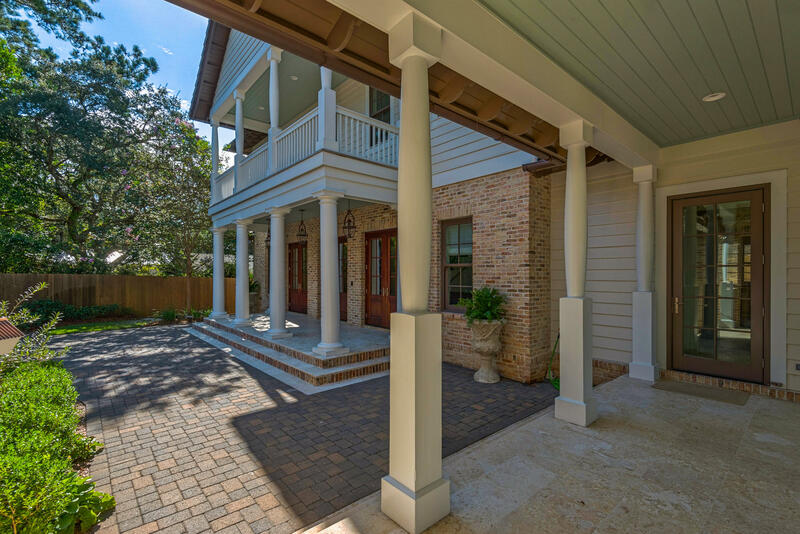 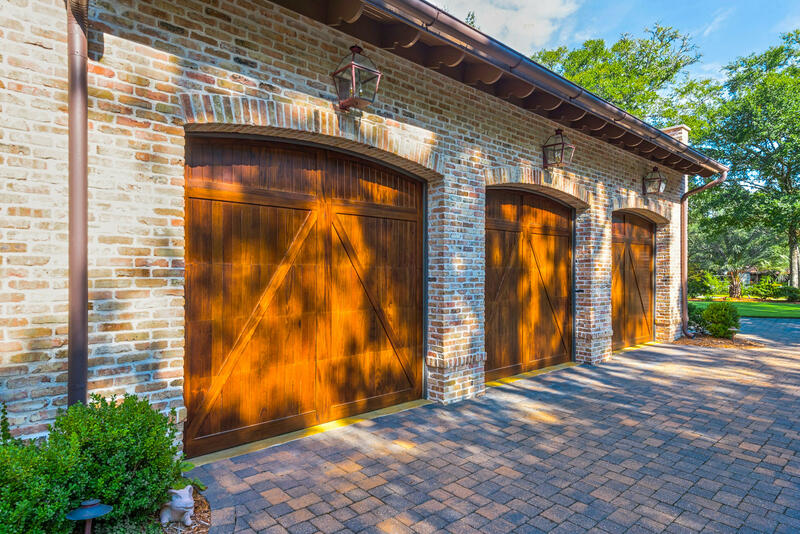 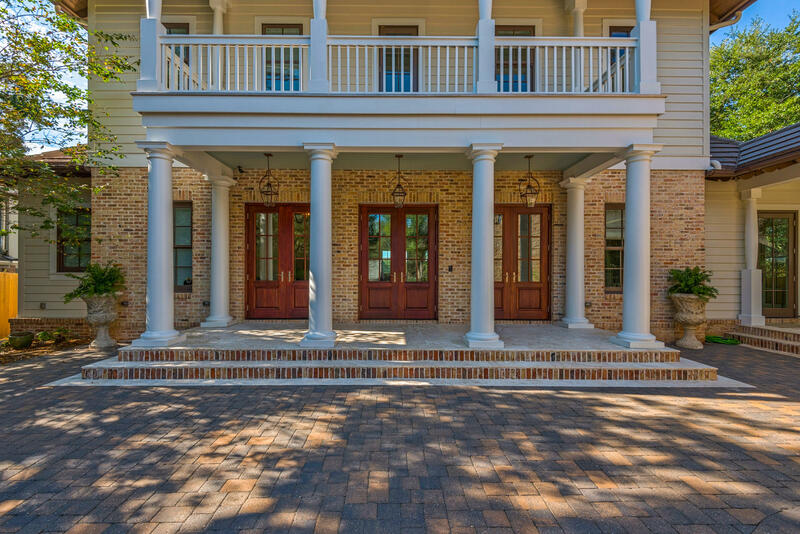 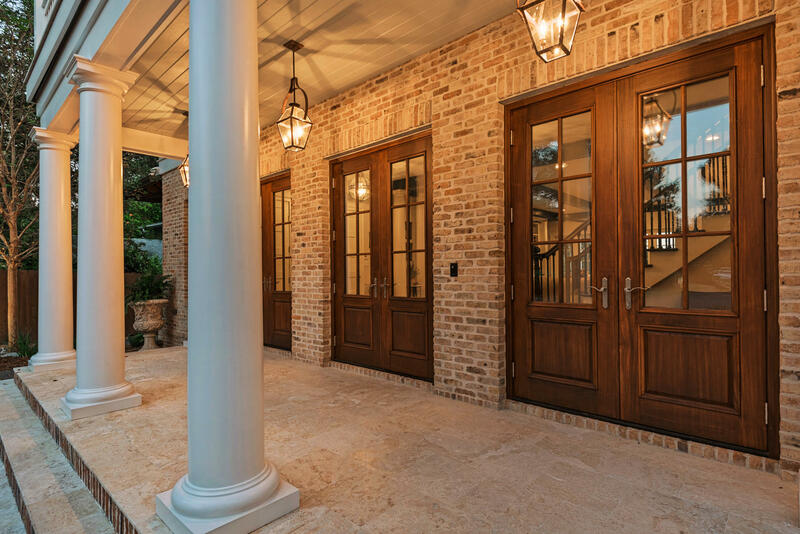 From the minute you drive up the pavered driveway you'll notice the quality and details everywhere. 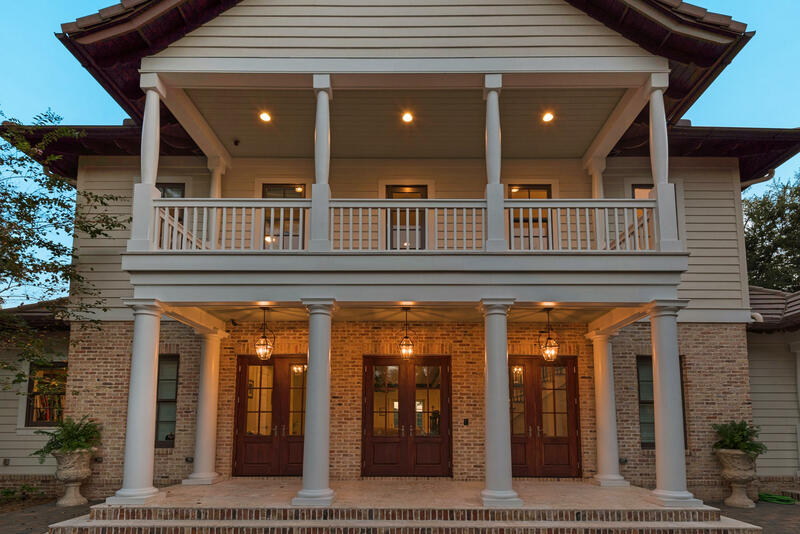 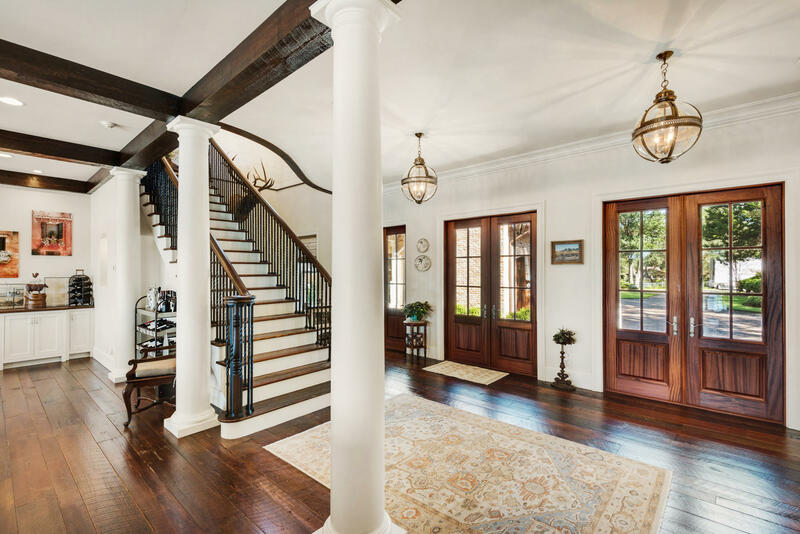 Step into the foyer to find columns, Victorian hotel pendent RH lighting and a dramatic open staircase with custom wrought iron. 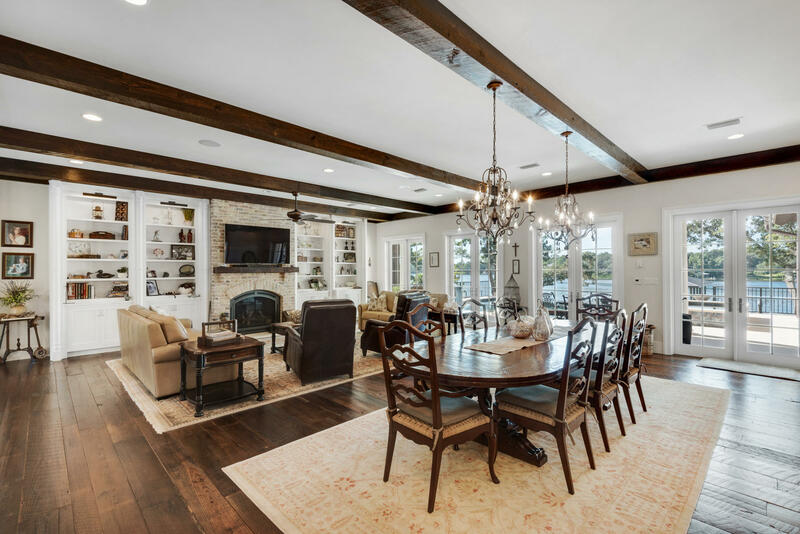 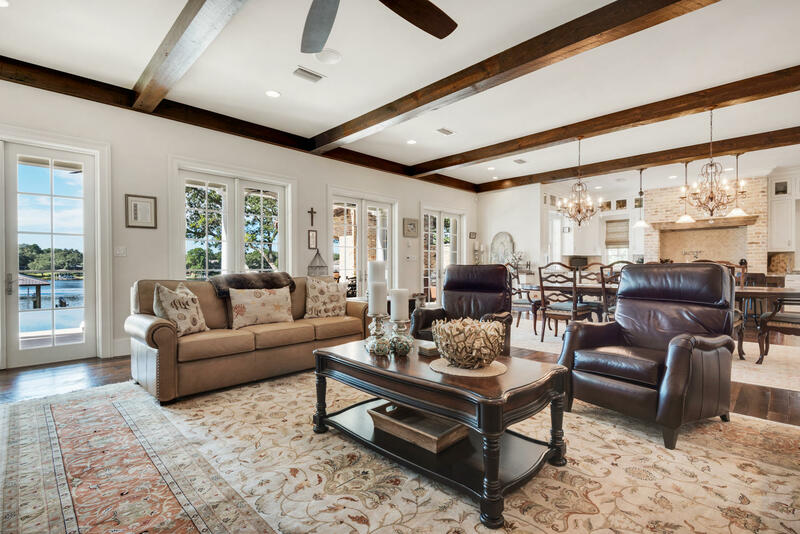 Spacious living area with beamed ceiling, custom built-in cabinets, gas fireplace, wide plank re-claimed heart pine flooring throughout, and windows that span the breathtaking views of infinity pool and water. 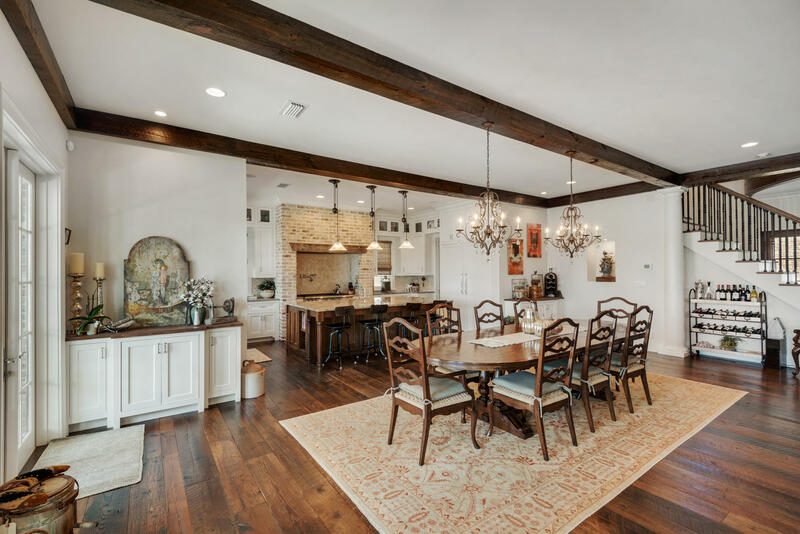 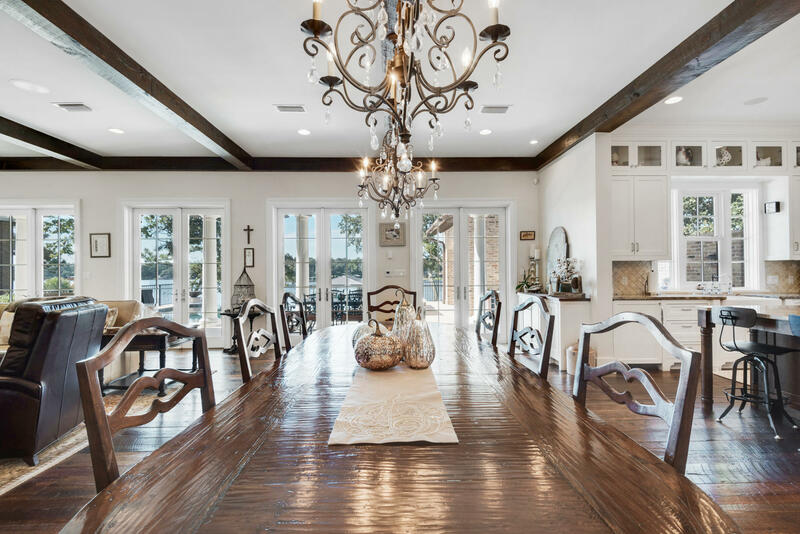 Entertaining will be a delight in your open concept dining area with two built-in buffets. 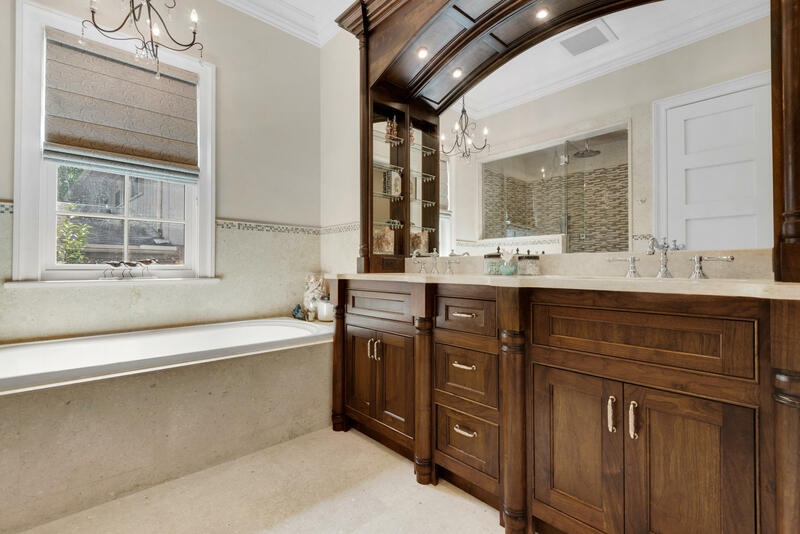 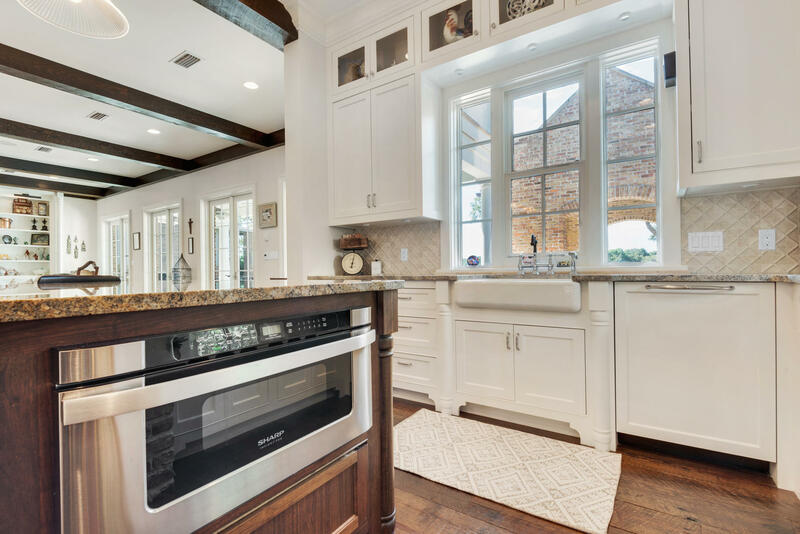 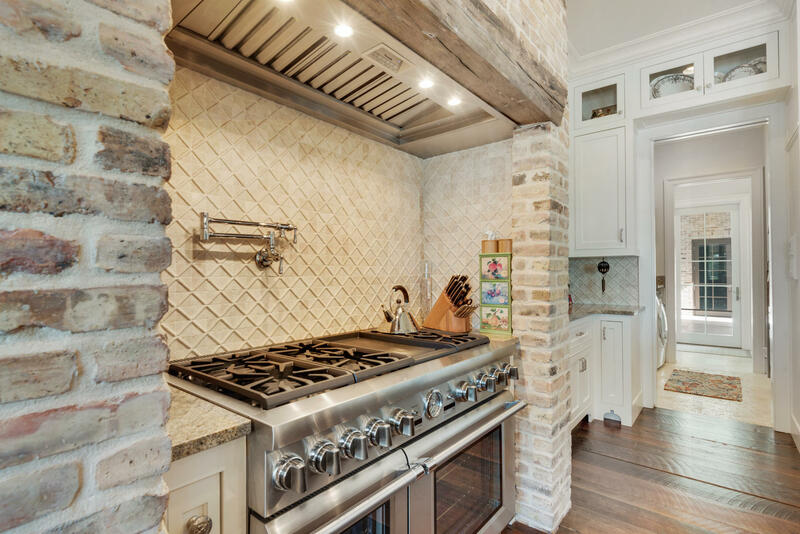 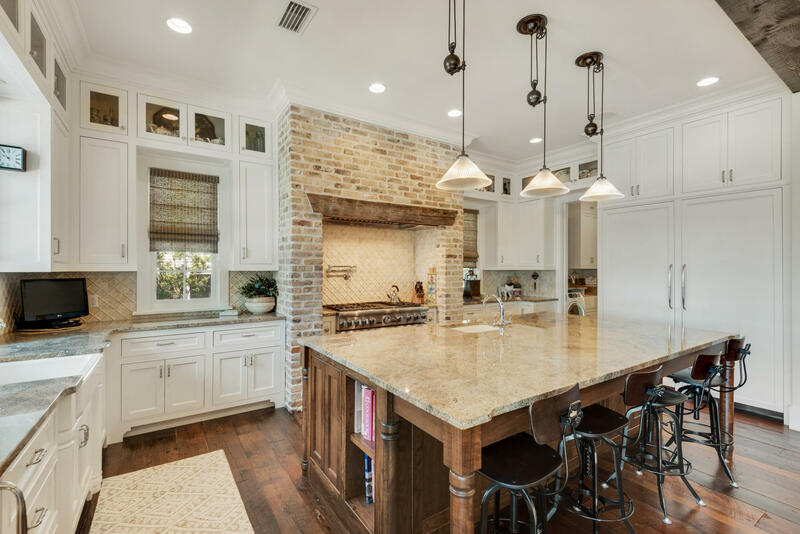 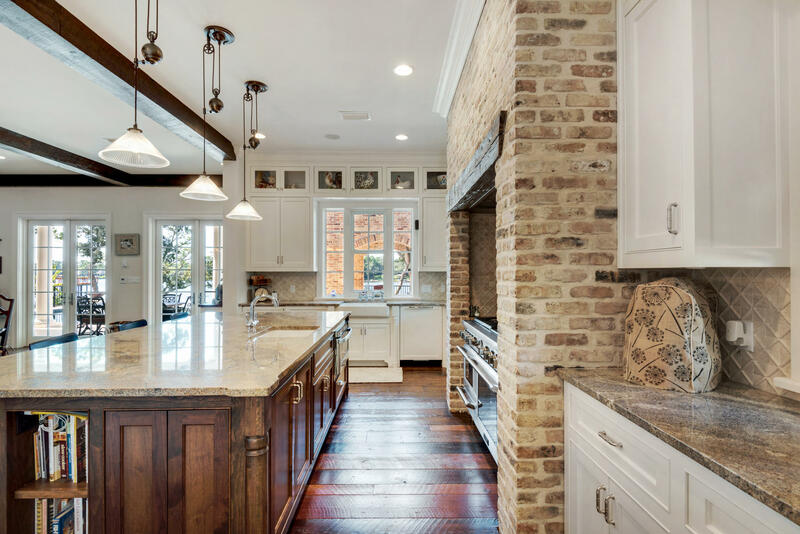 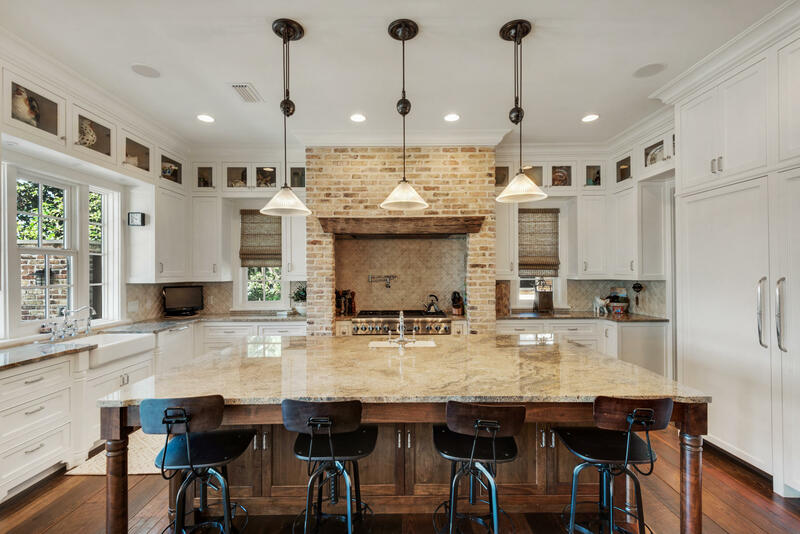 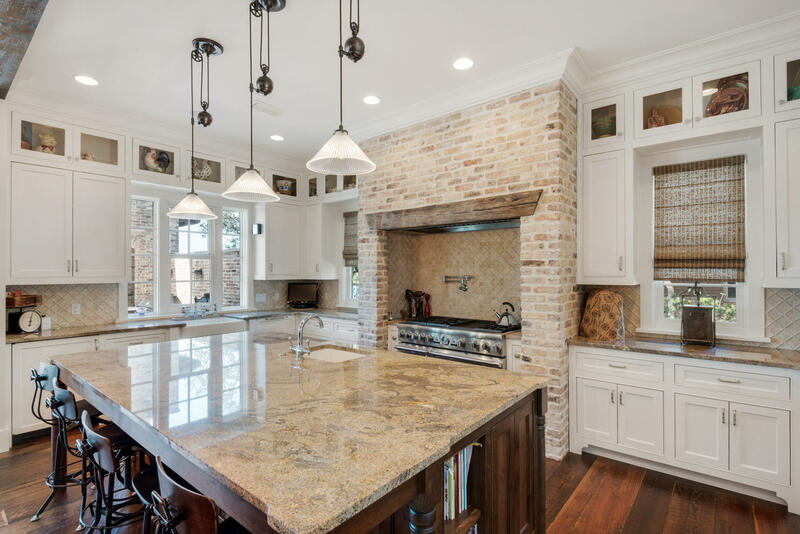 Gourmet kitchen is top-of-the line with Thermador appliances, sub-zero icemaker and beverage cooler, custom cabinets with glass fronts above, beautiful granite counter space, and large center island with a breakfast bar. 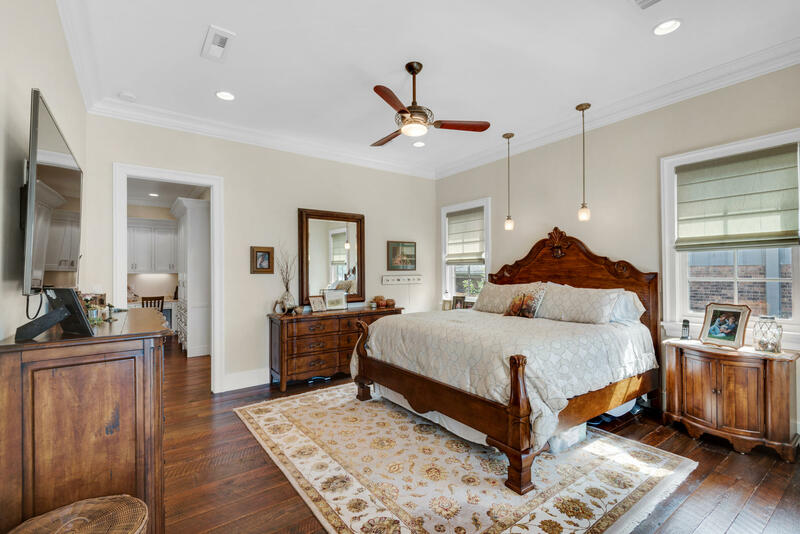 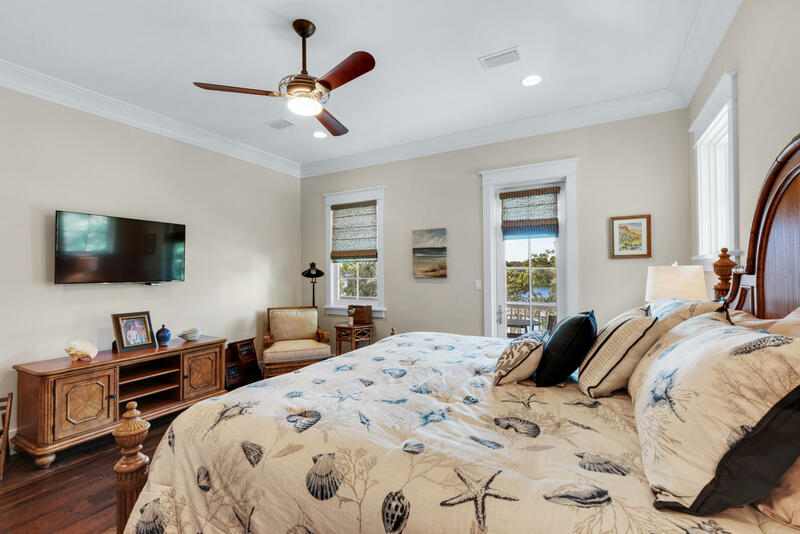 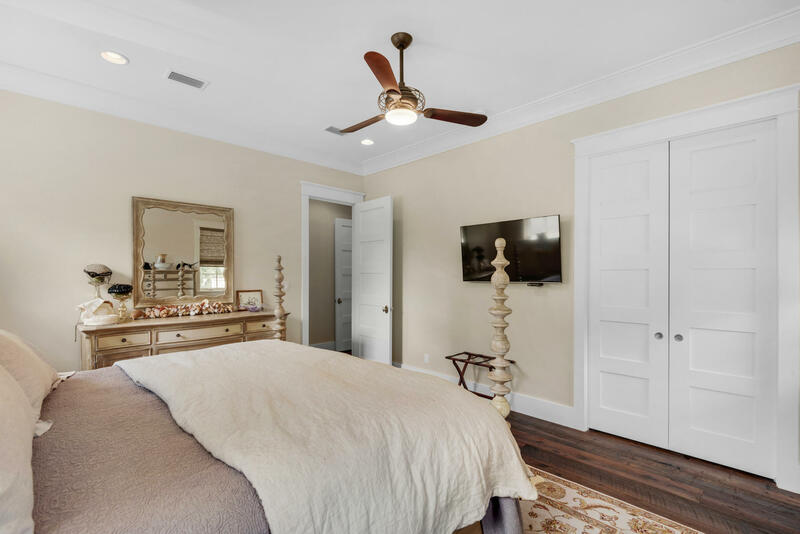 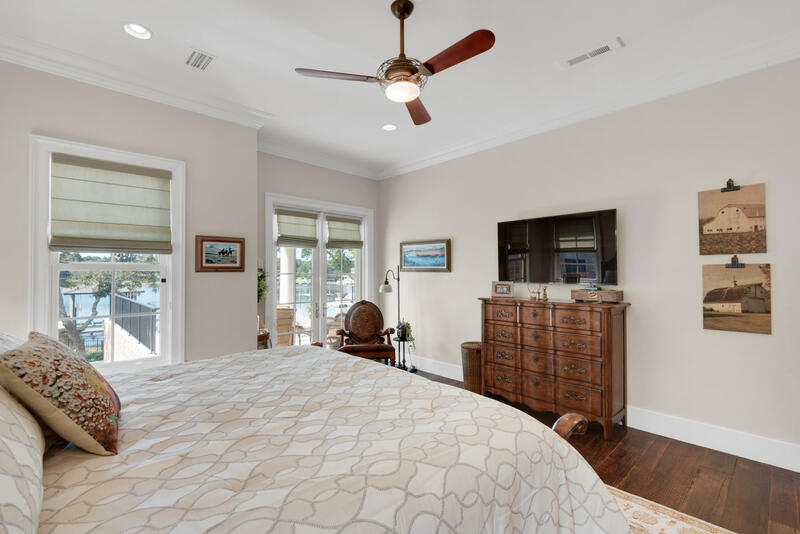 Waterfront master bedroom suite with access to the pool and spa, separate bath with double vanities, spa tub, and a large steam shower with seat, separate walk-in closet, and a make-up station or office area. 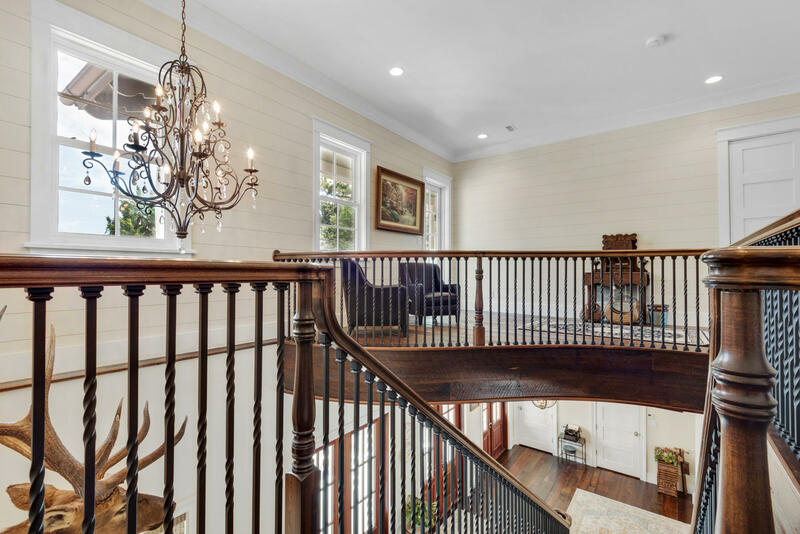 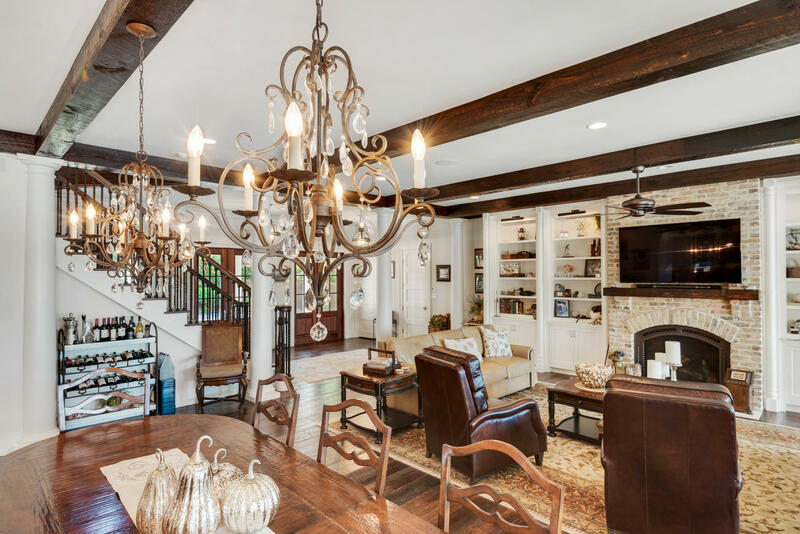 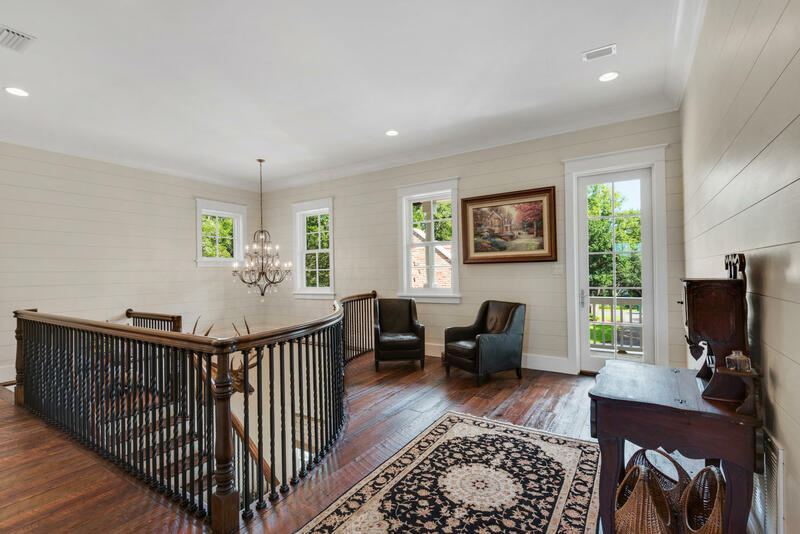 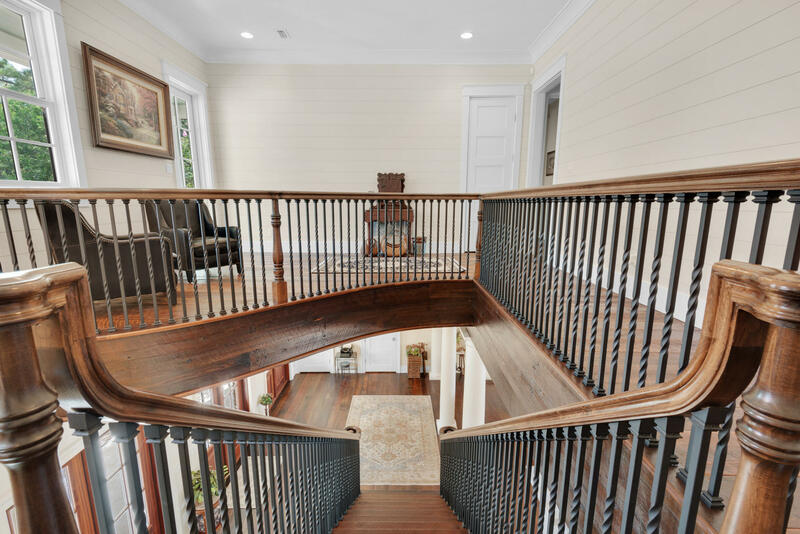 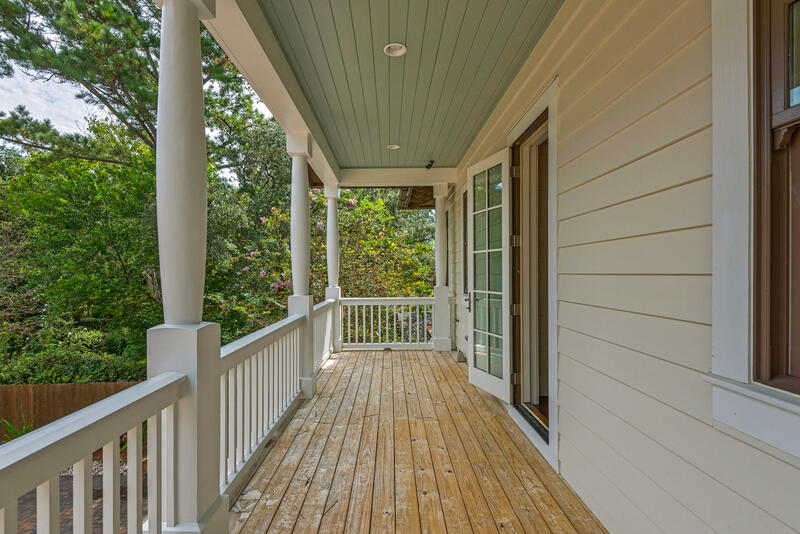 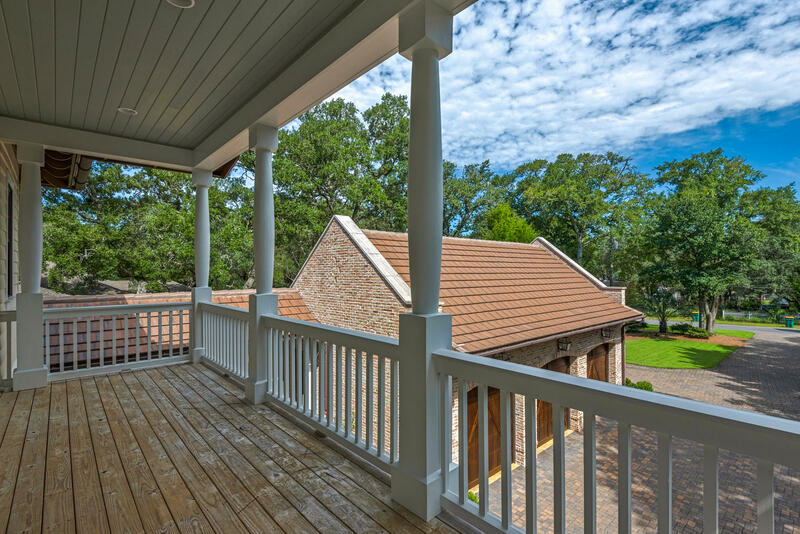 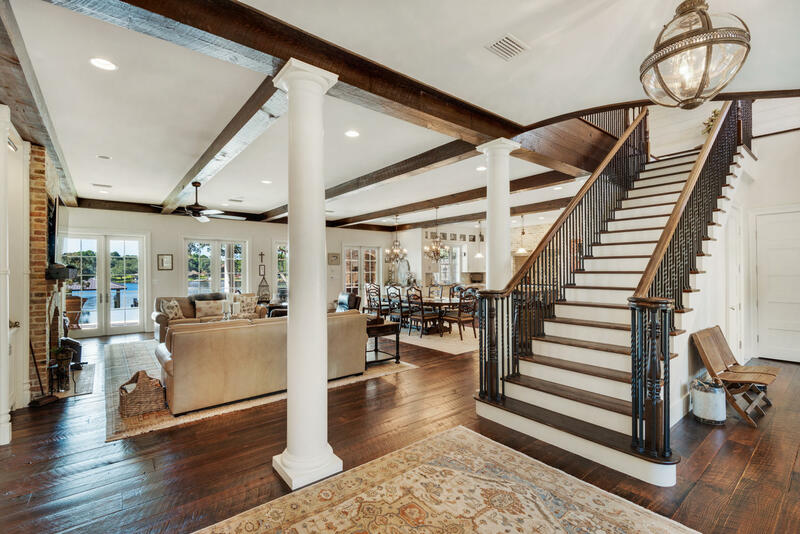 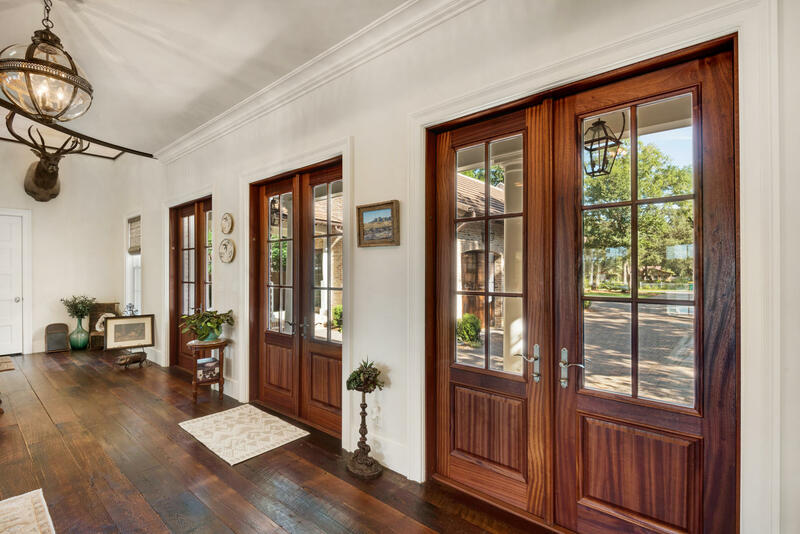 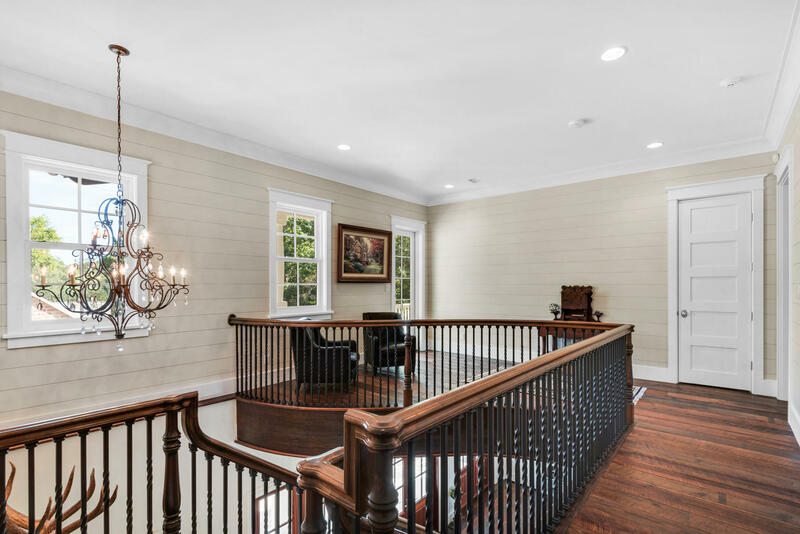 Ascending up the staircase you will find a free standing walnut piano curved overlook perfectly appointed for the sitting area with ship lap walls and French doors that lead out to the front balcony. 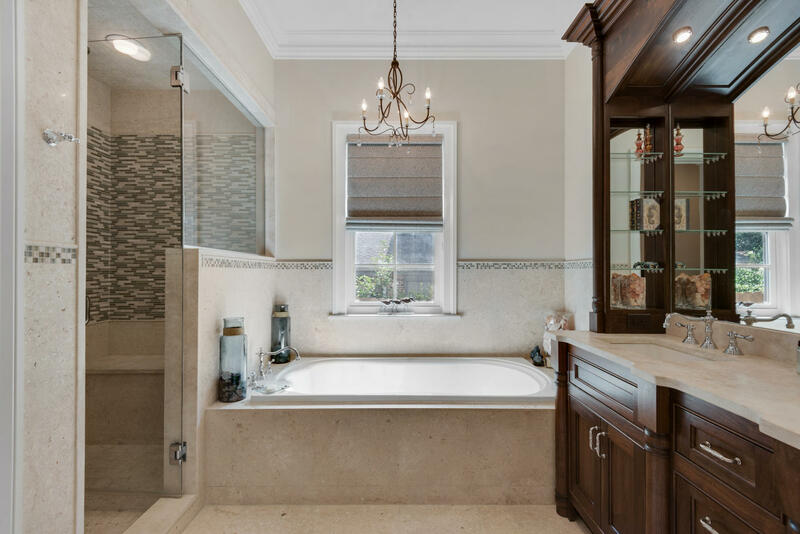 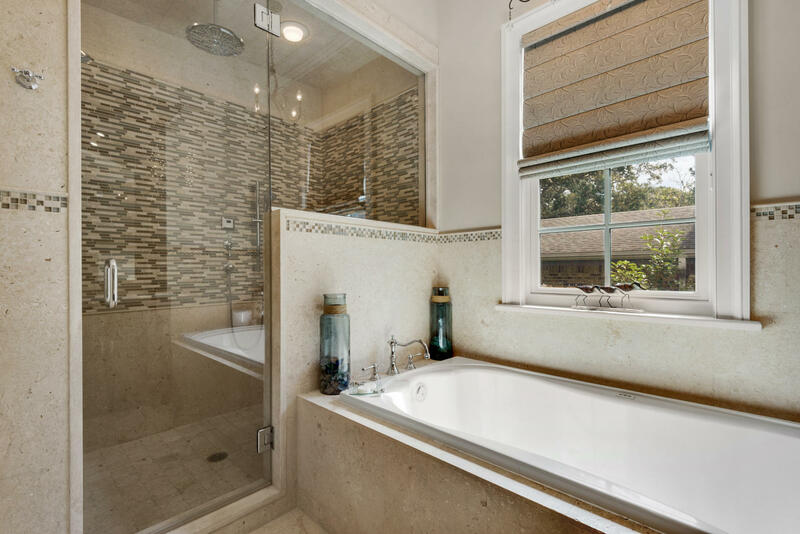 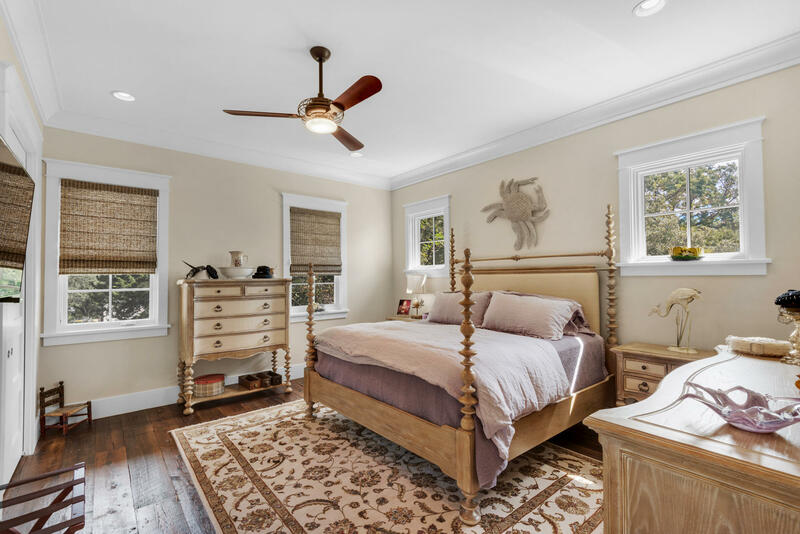 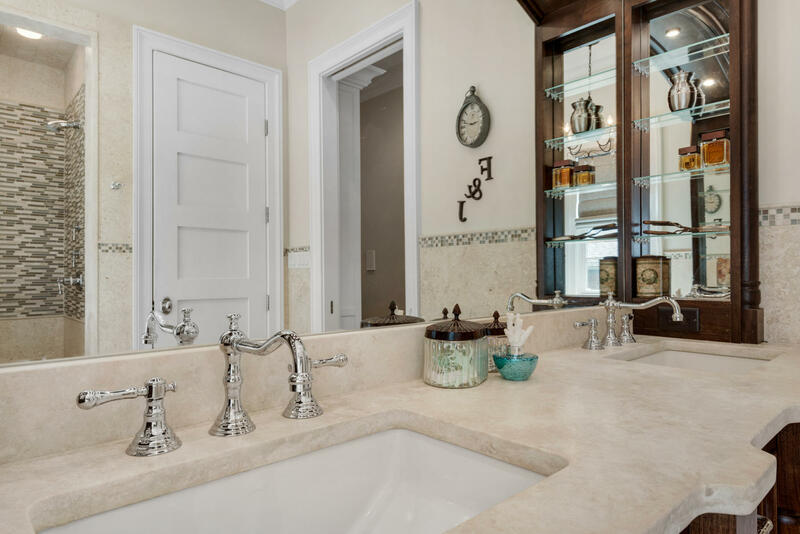 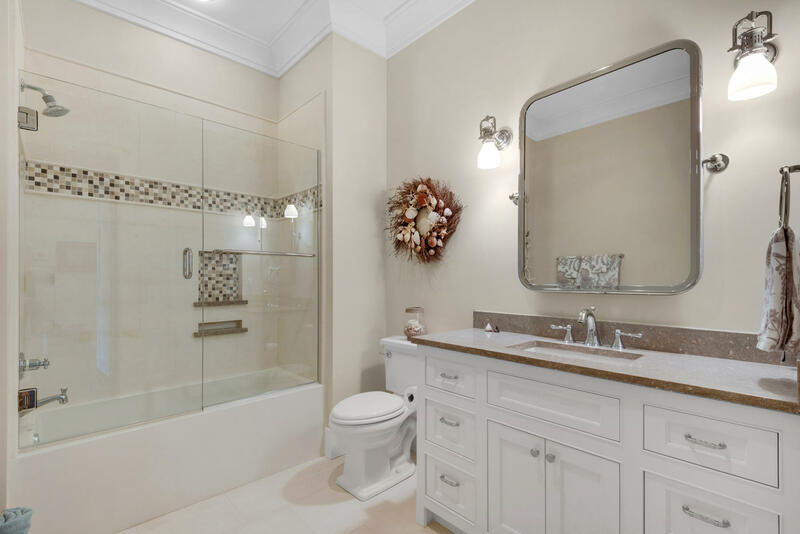 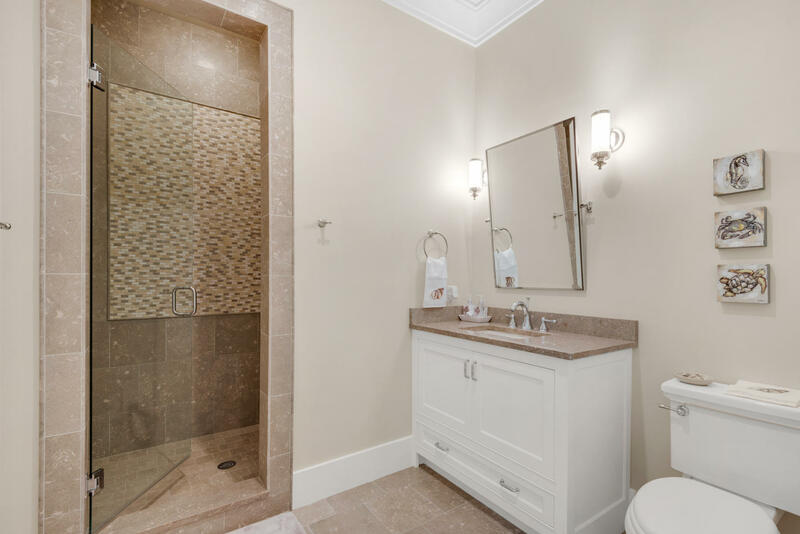 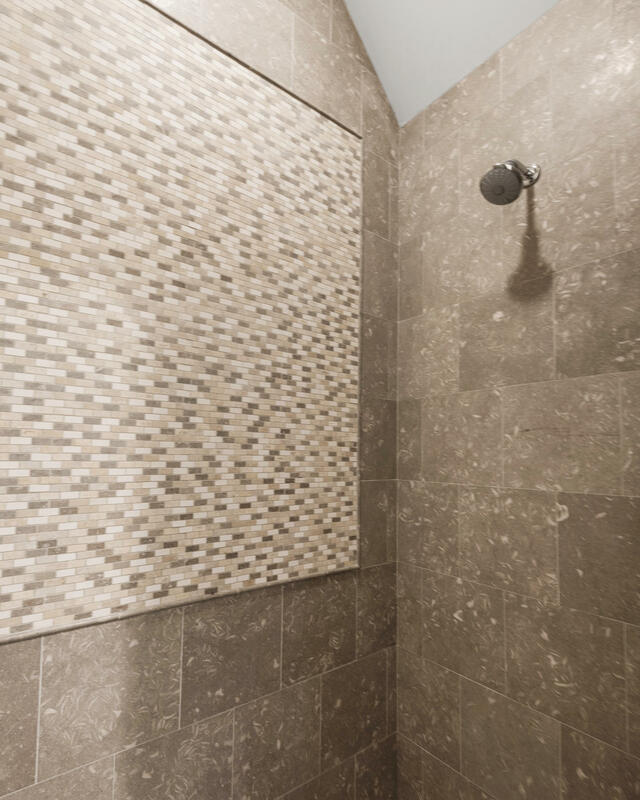 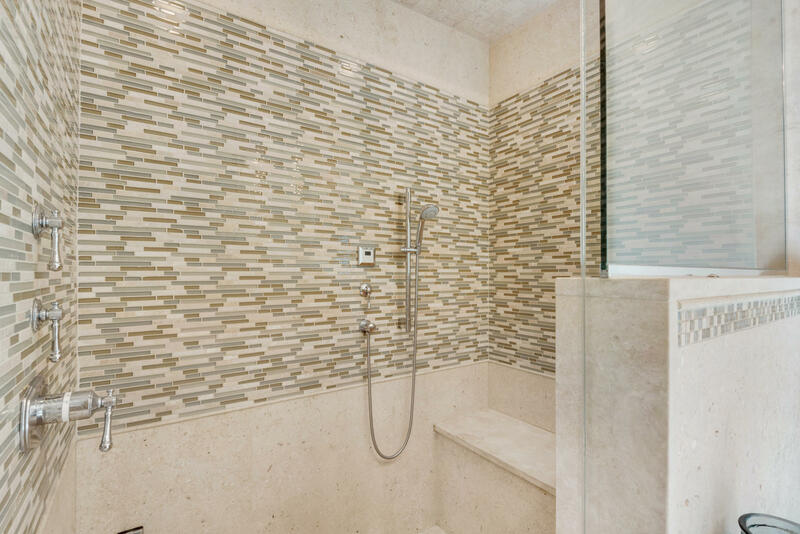 Two additional bedroom suites with baths. 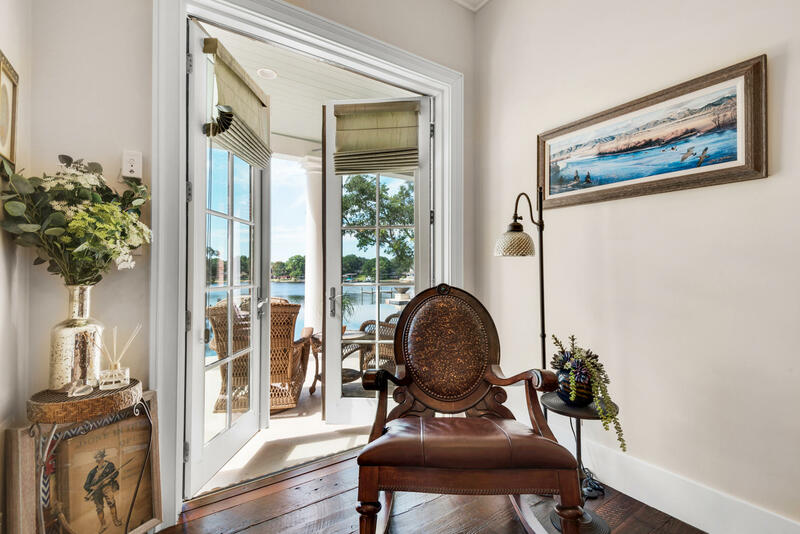 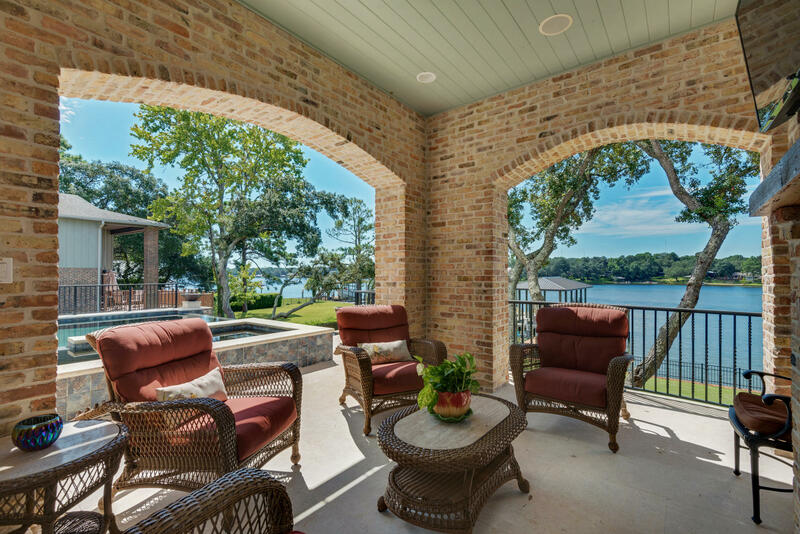 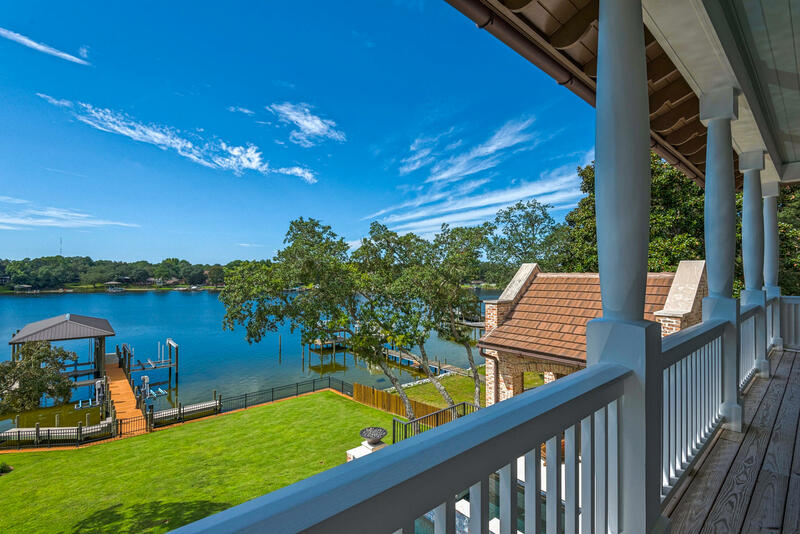 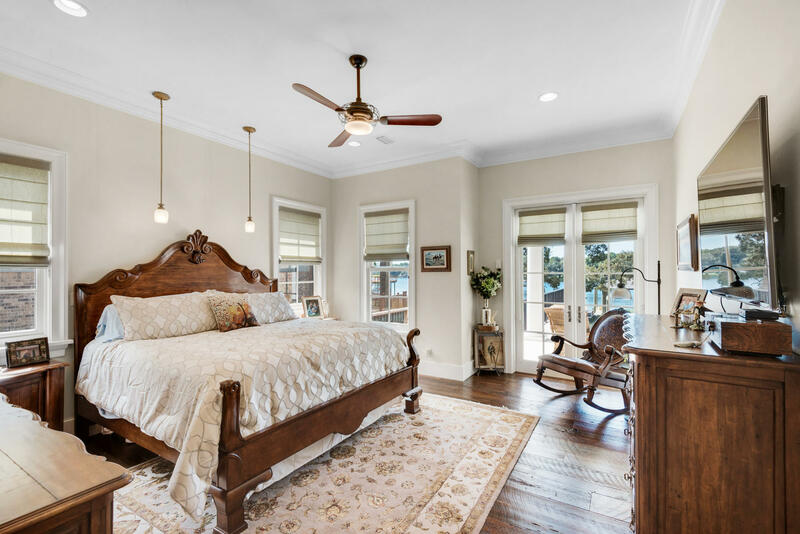 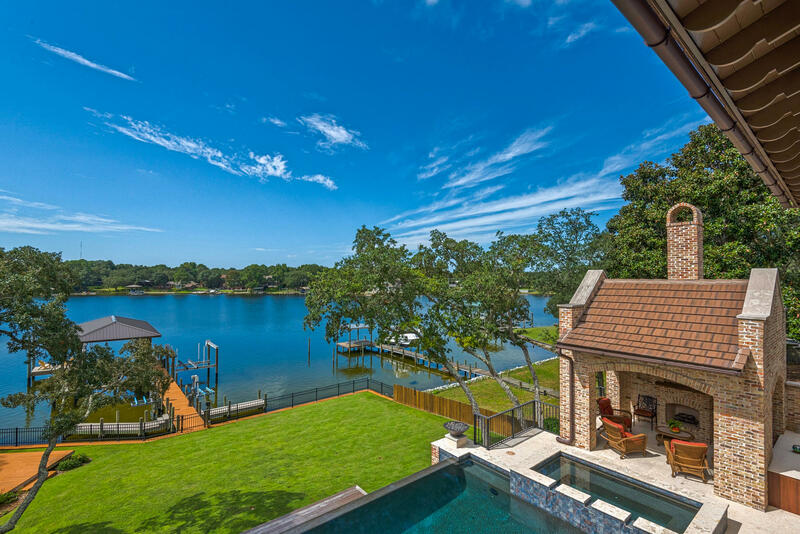 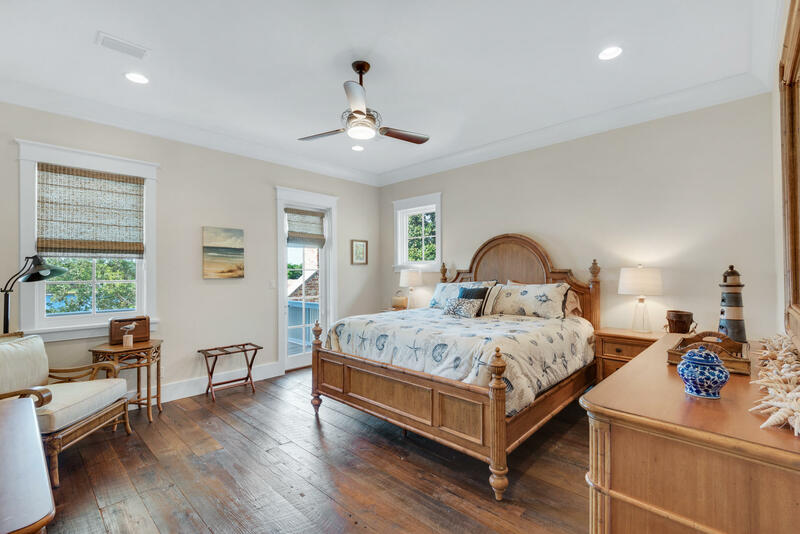 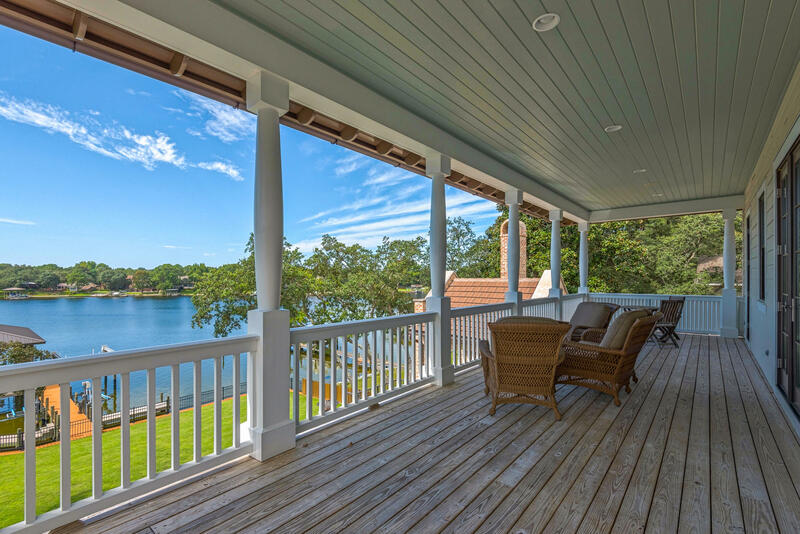 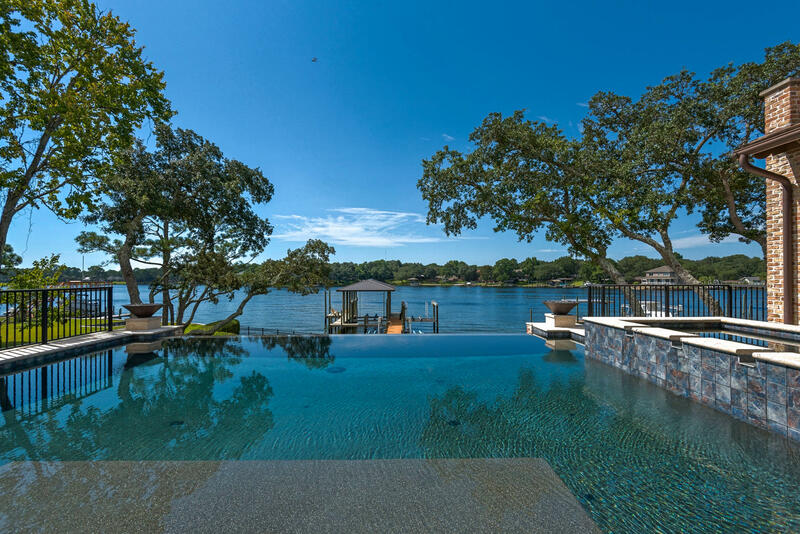 One of the bedrooms is waterfront and has access to the 38ft x 10ft balcony with incredible water views. 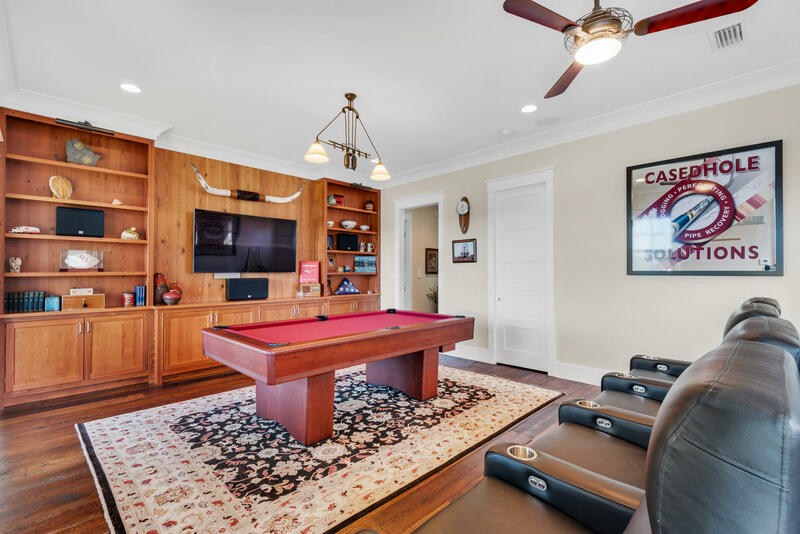 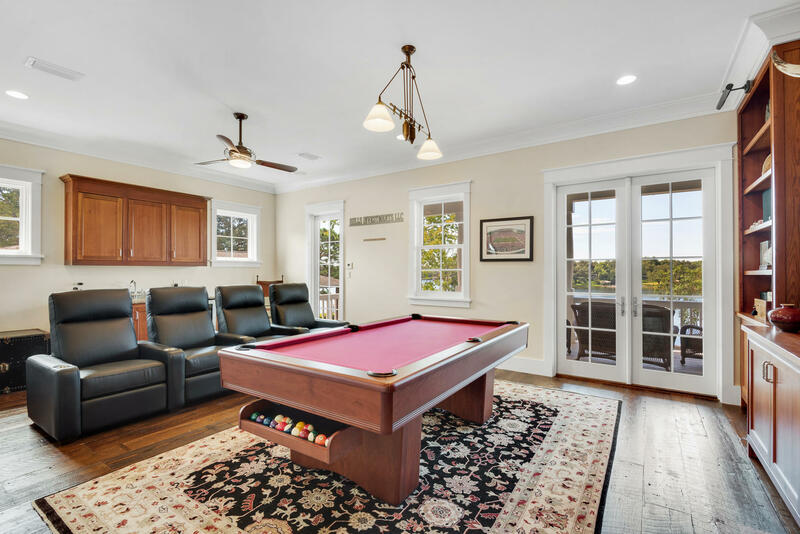 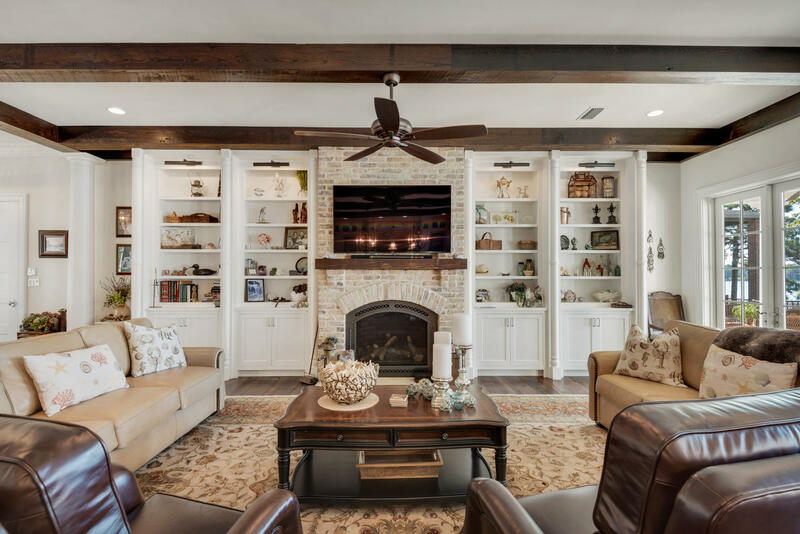 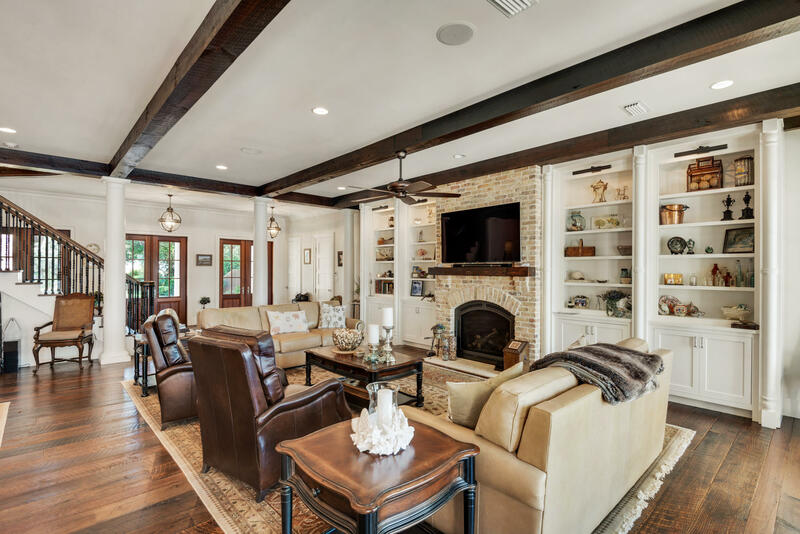 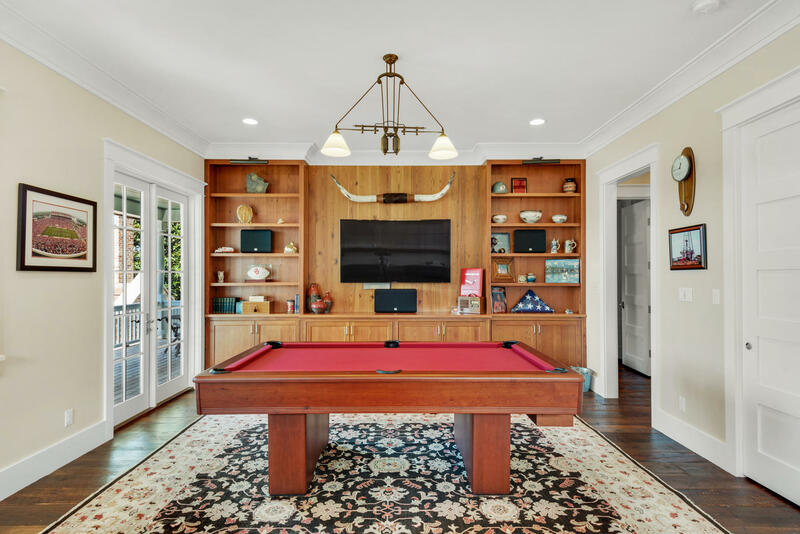 Ultimate game room complete with custom built-in heart pine cabinets, surround sound and a wet bar with subzero beverage refrigerator this room could also be used as a fourth bedroom/office with separate access to the balcony. 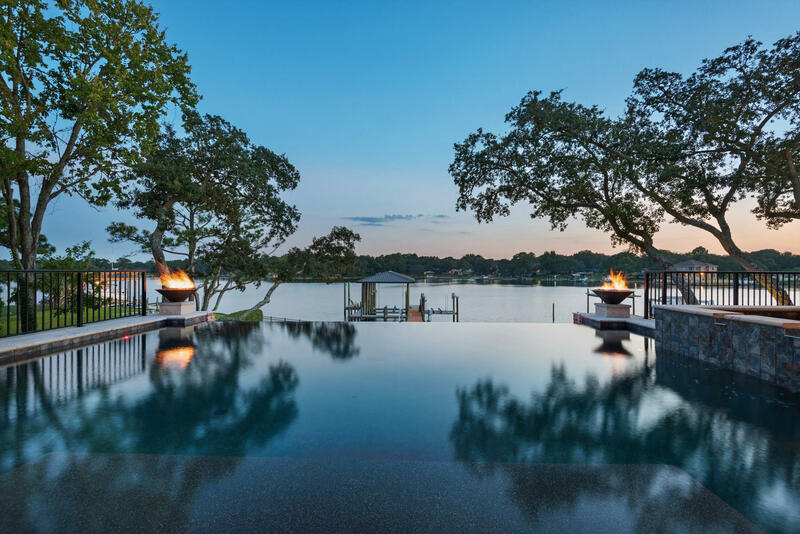 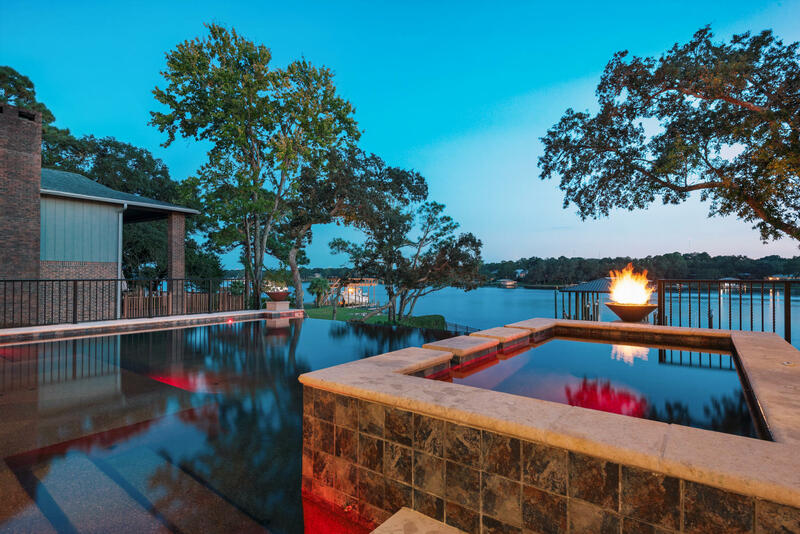 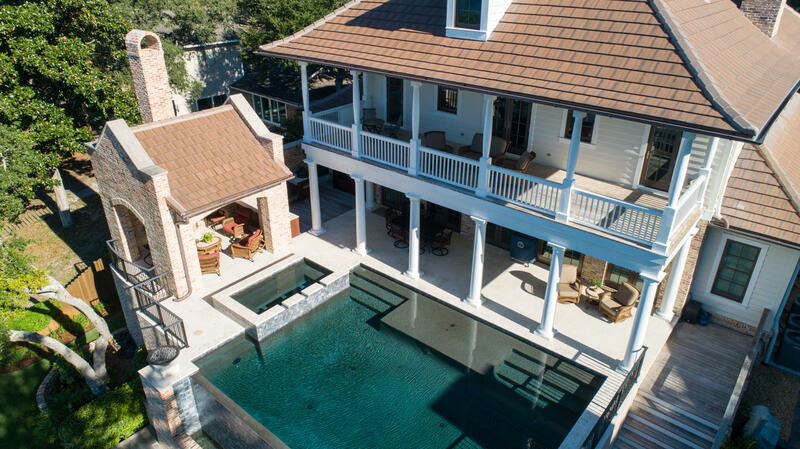 Your resort lifestyle awaits you in the backyard with a custom designed heated infinity pool with tanning ledge and spa surrounded with coral stone pavers for cool decking and two firepots for ambience. 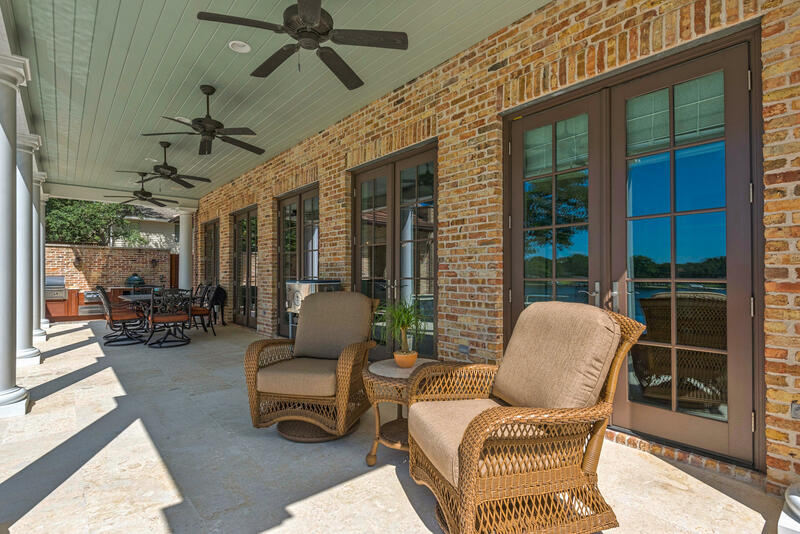 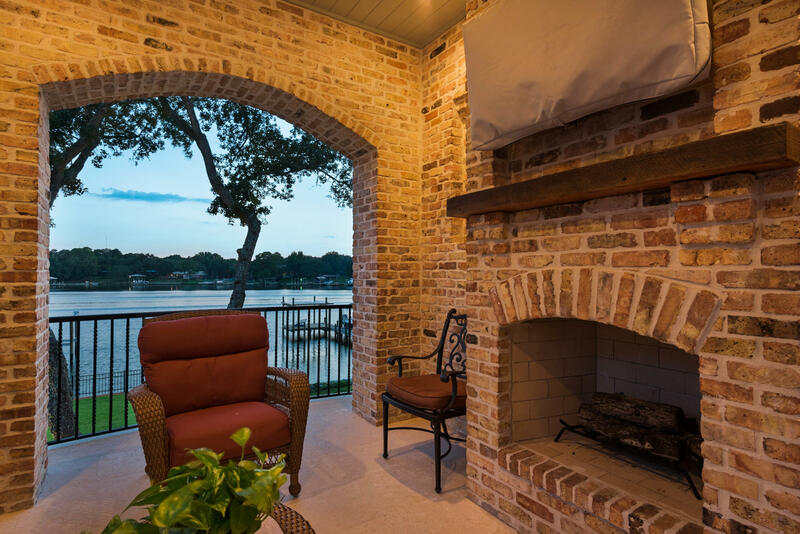 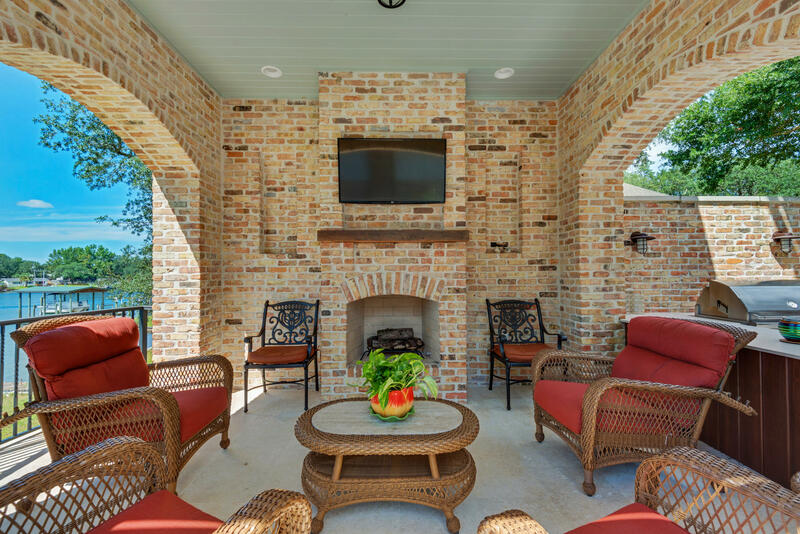 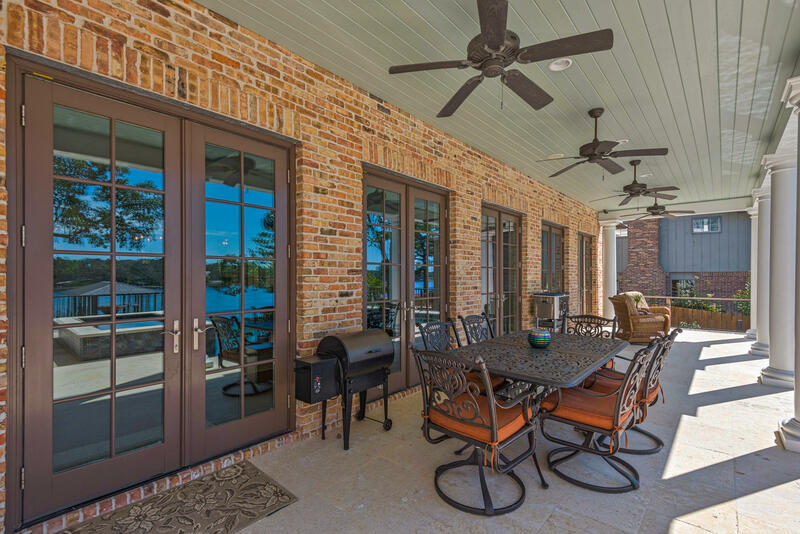 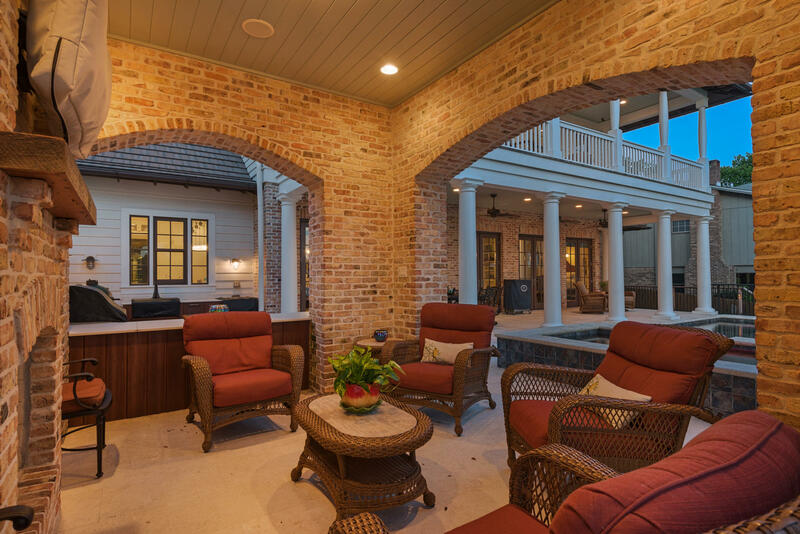 Imagine entertaining family and friends year round in your outdoor brick cabana with fireplace, media and surround sound. 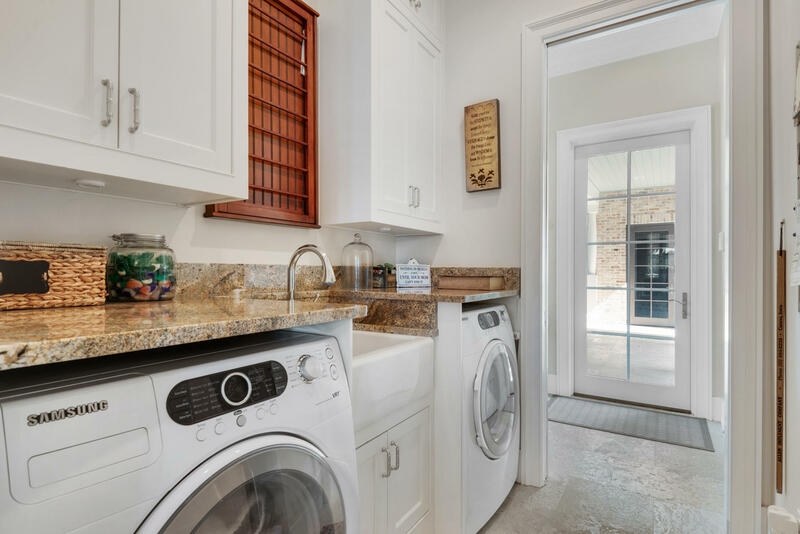 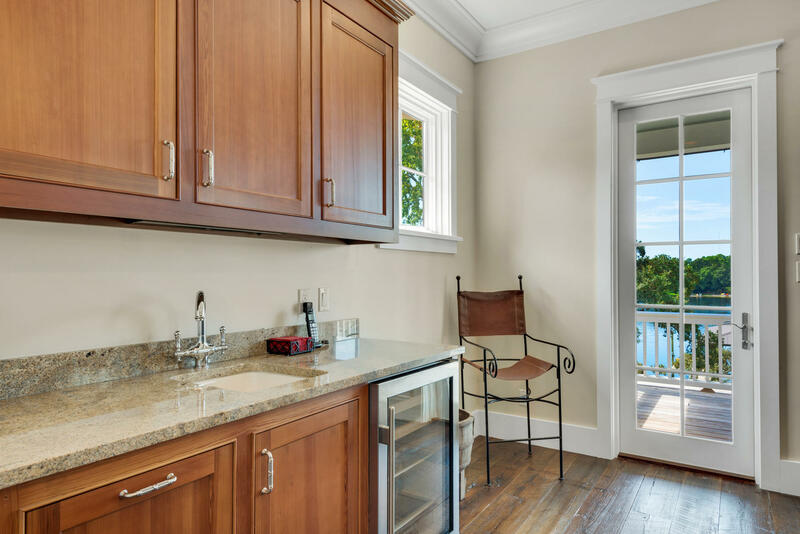 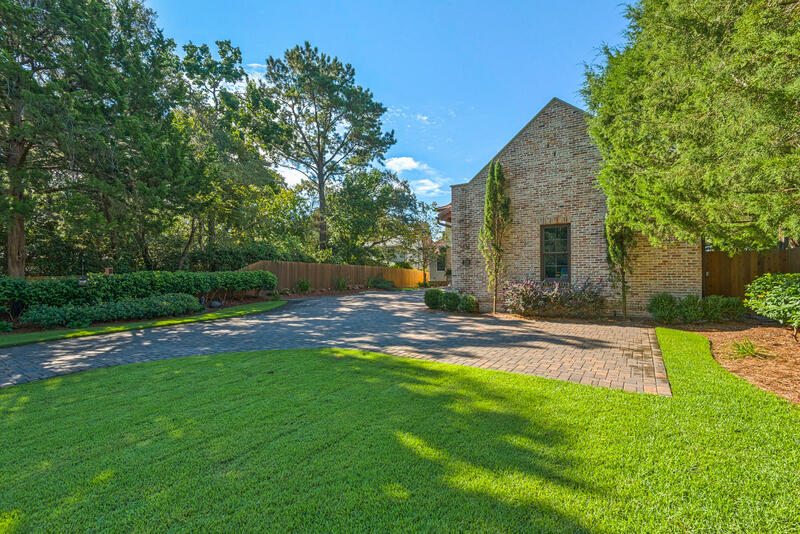 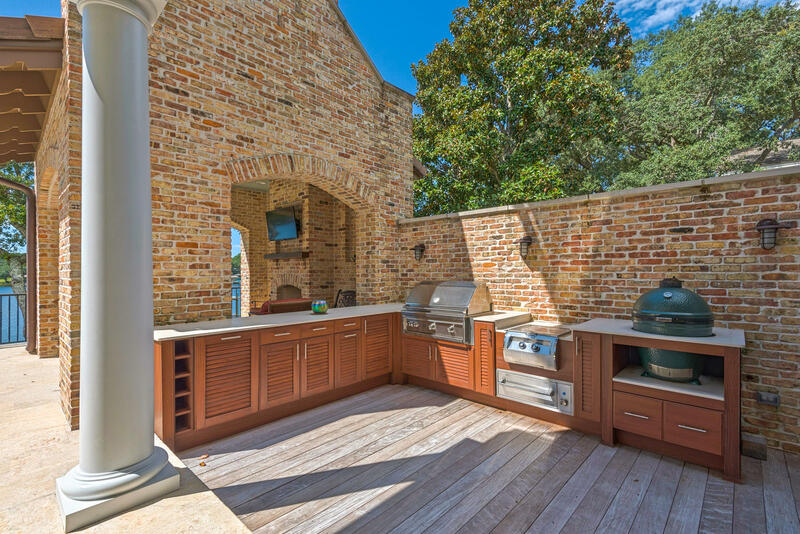 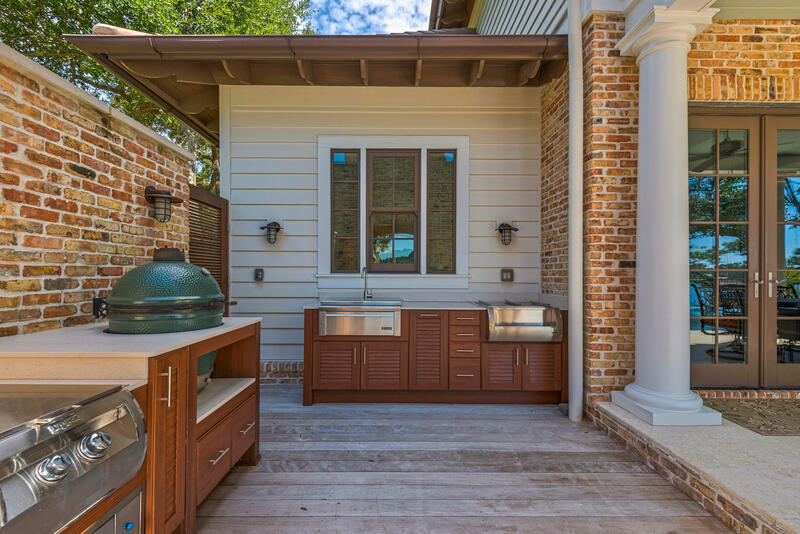 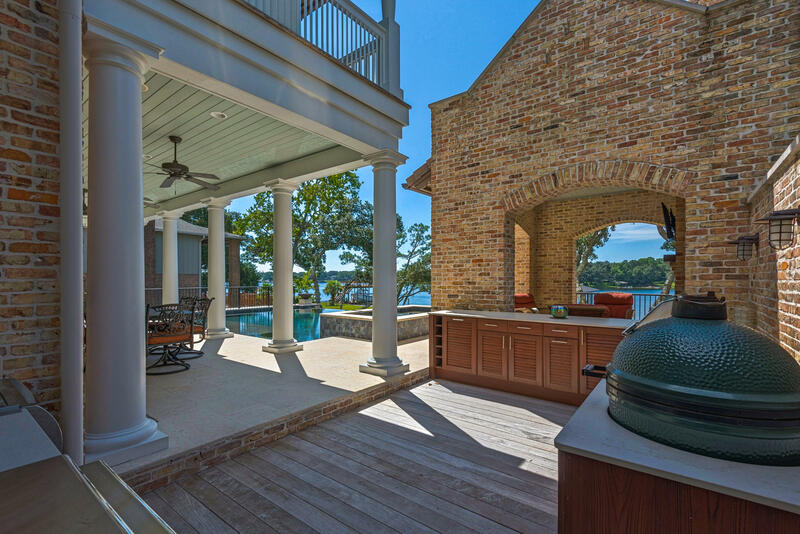 Outdoor kitchen with Naturekast cabinetry, Lynx and Fire Magic appliances to include gas grill, sink with hot and cold water, warming drawer, separate gas burner and beverage center, Brazilian hardwood deck and plenty of counter space for parties of any size you host. 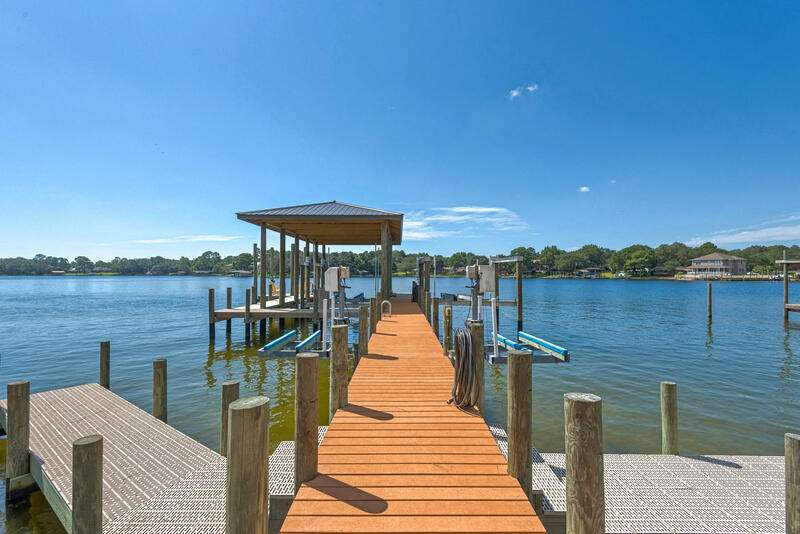 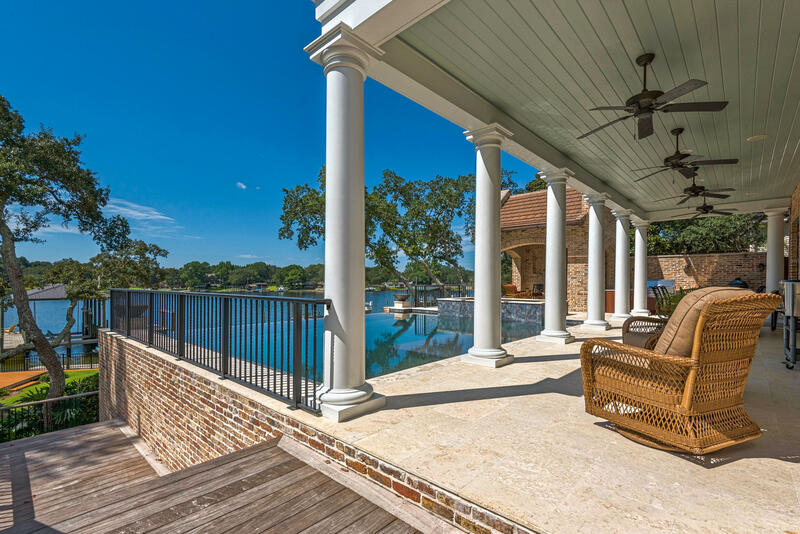 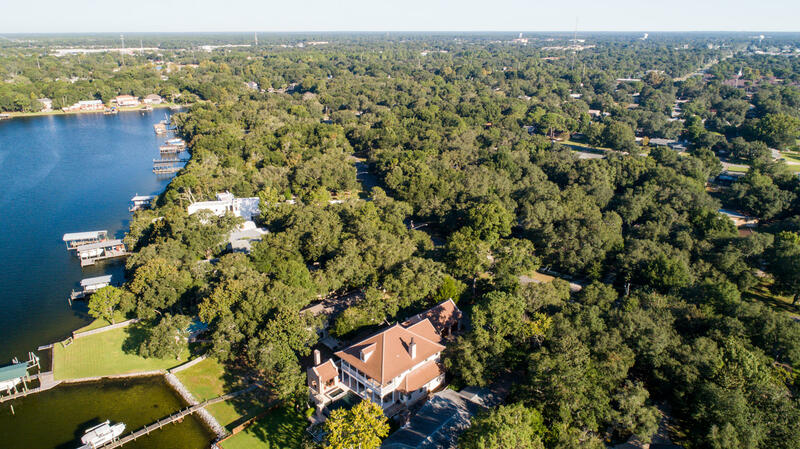 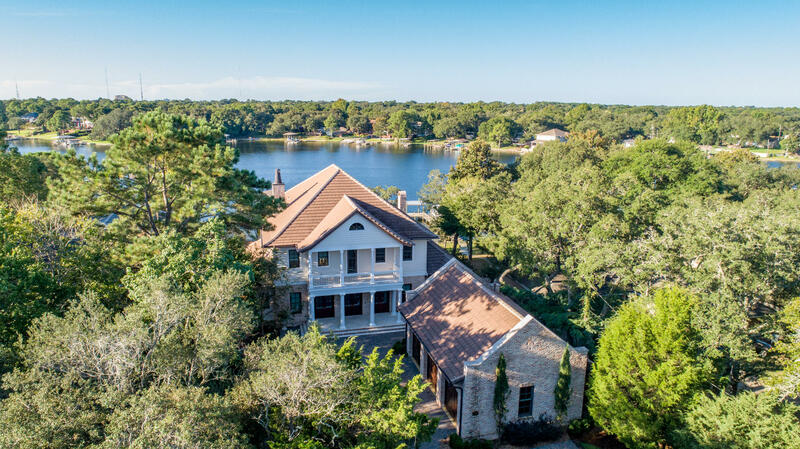 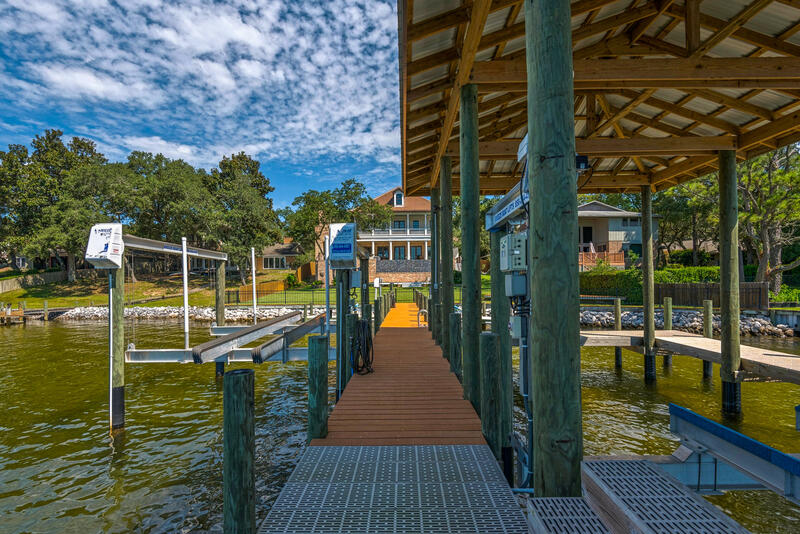 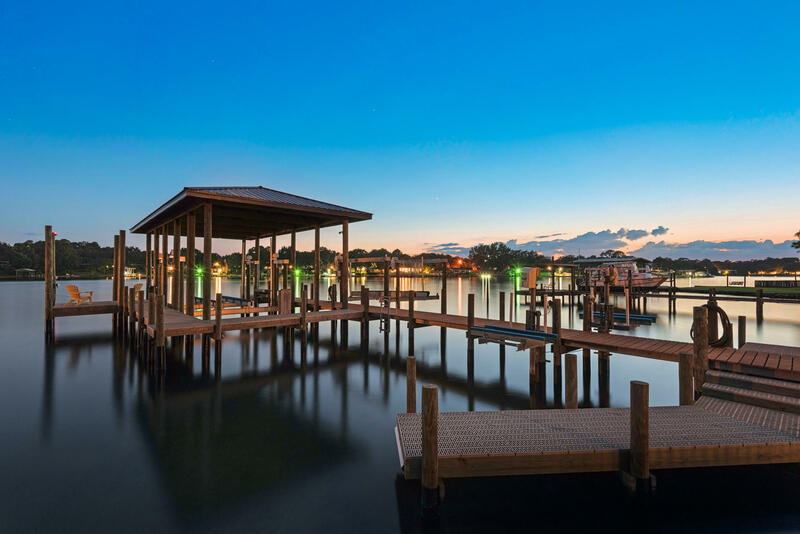 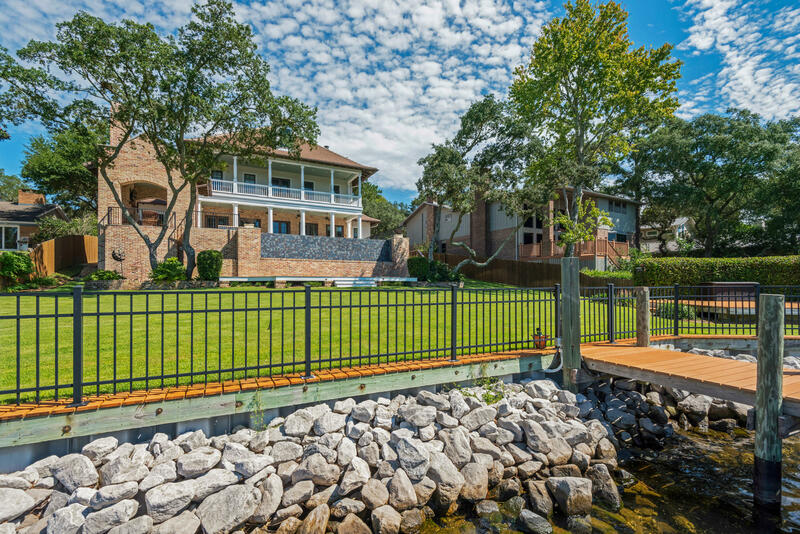 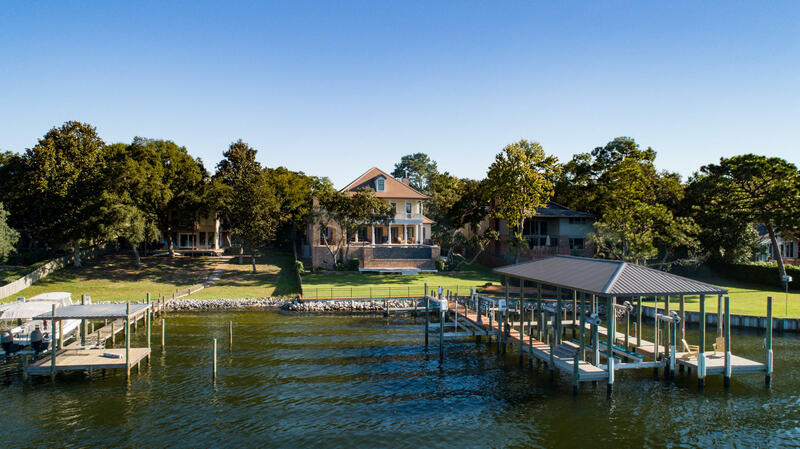 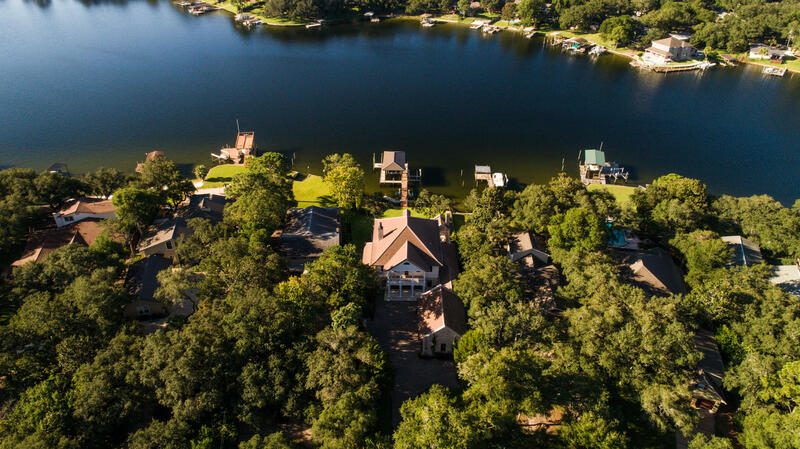 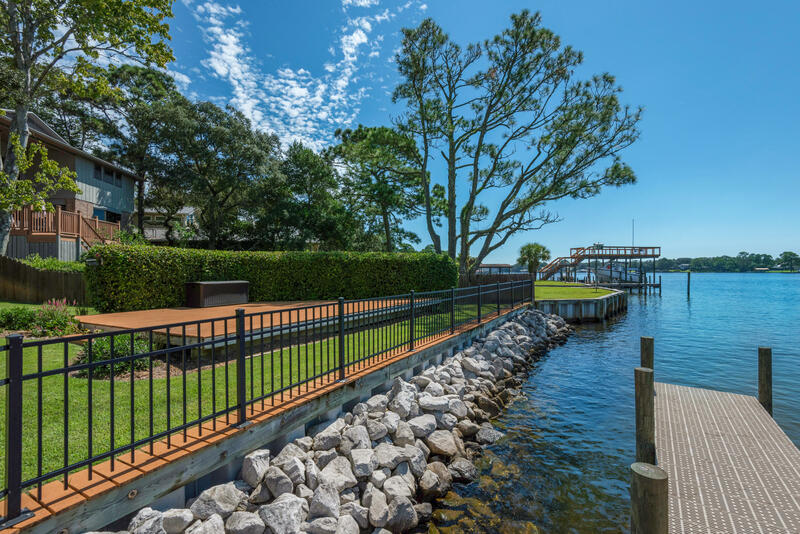 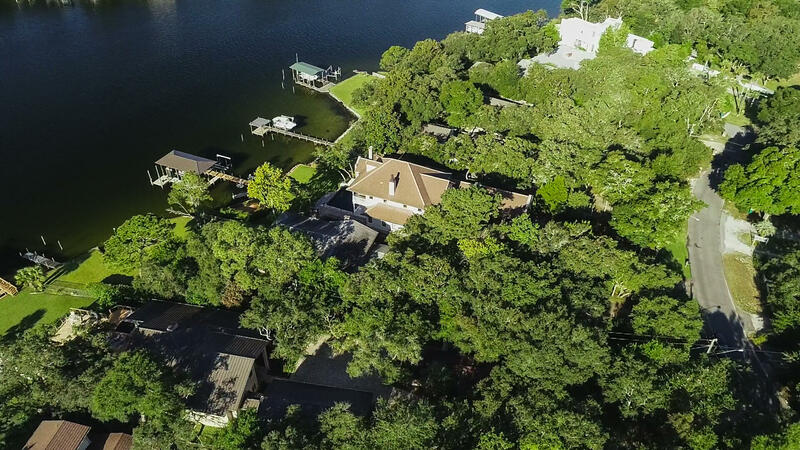 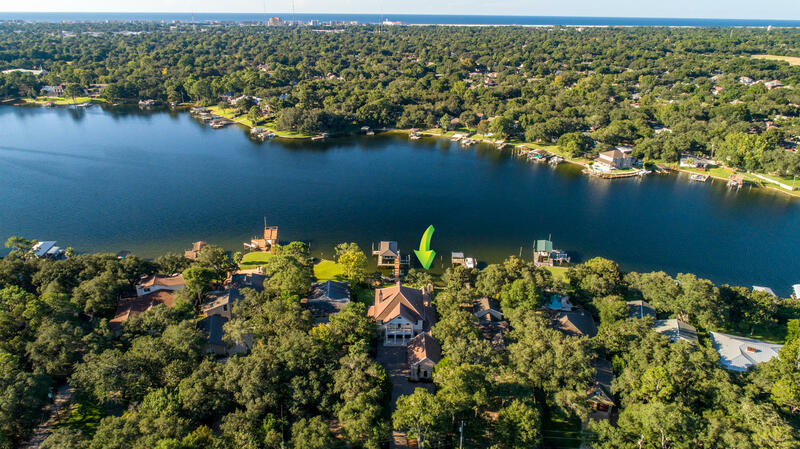 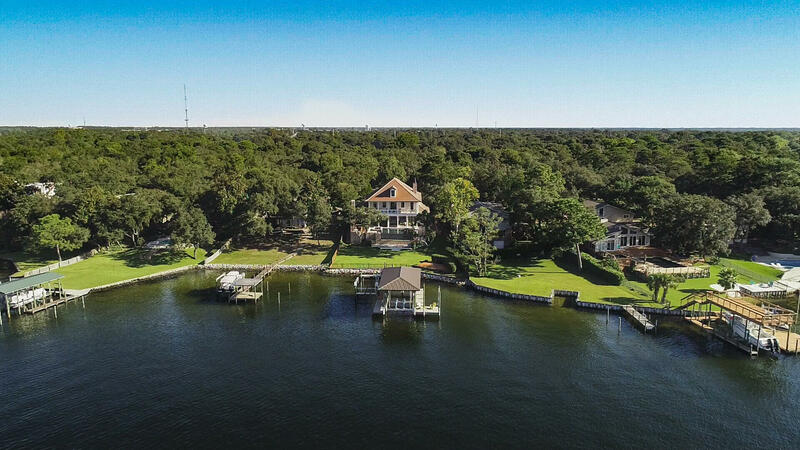 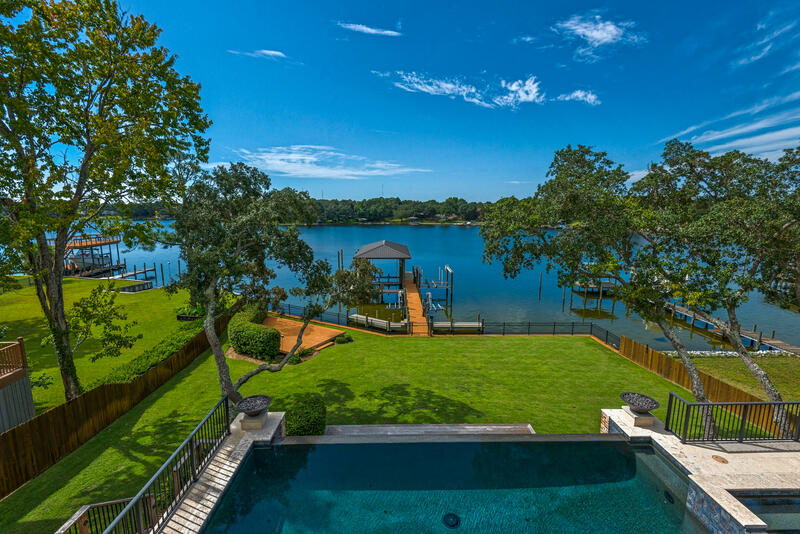 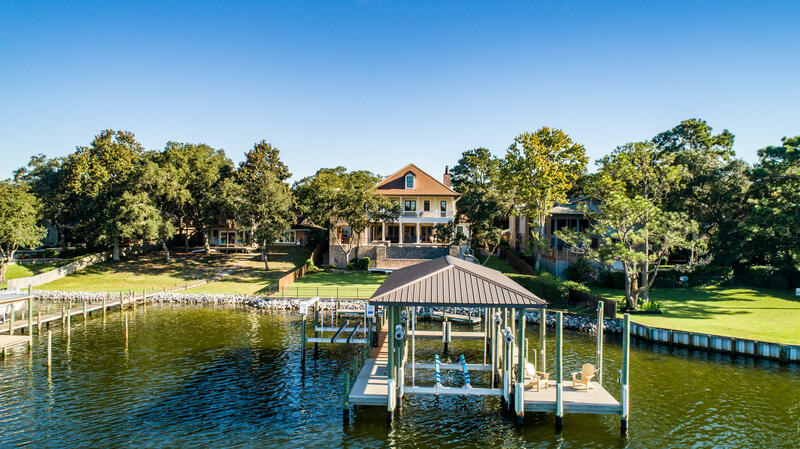 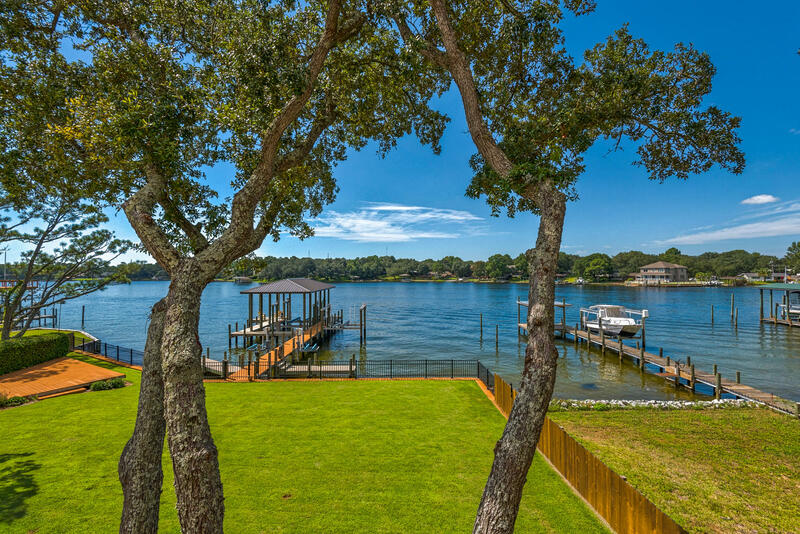 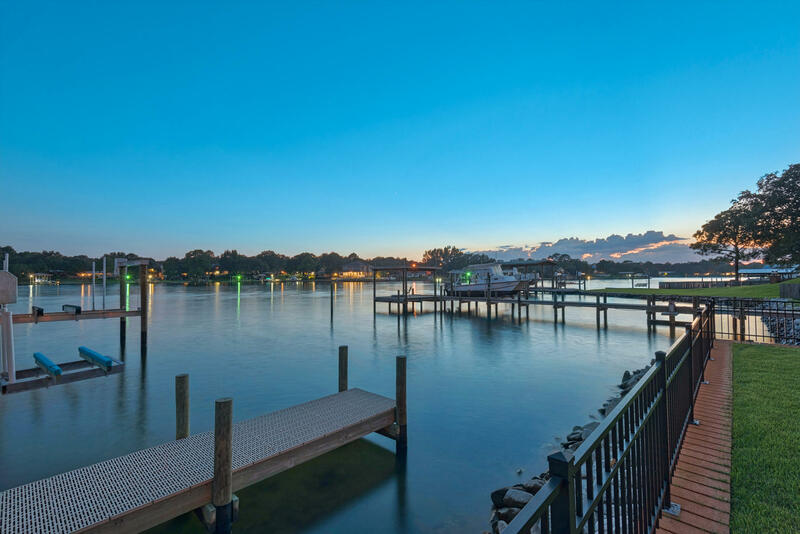 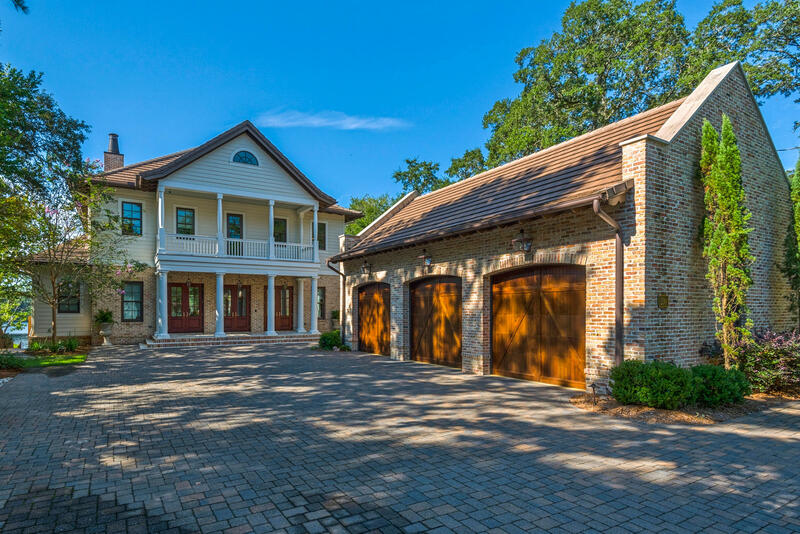 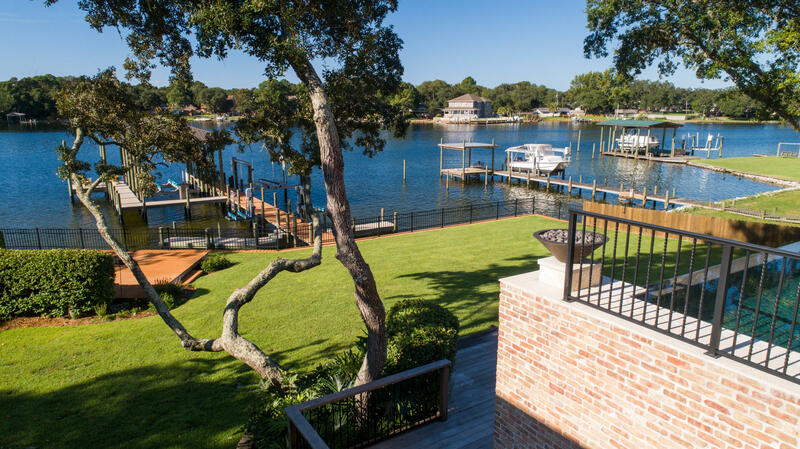 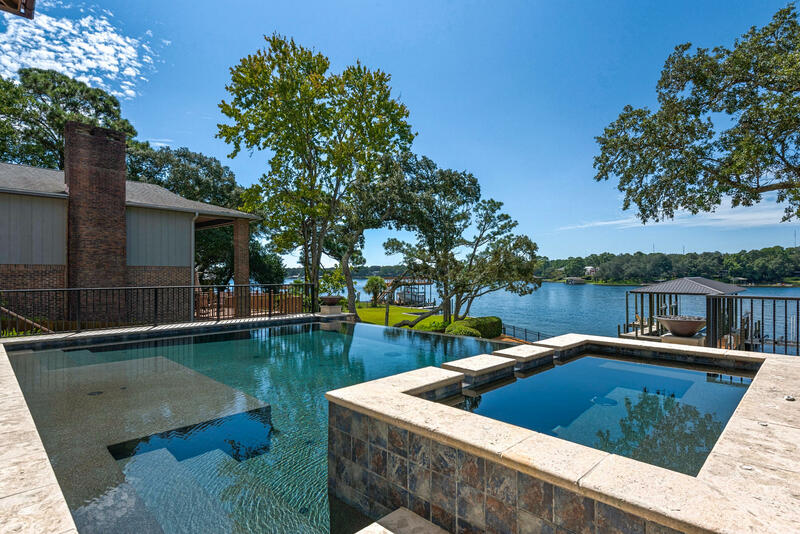 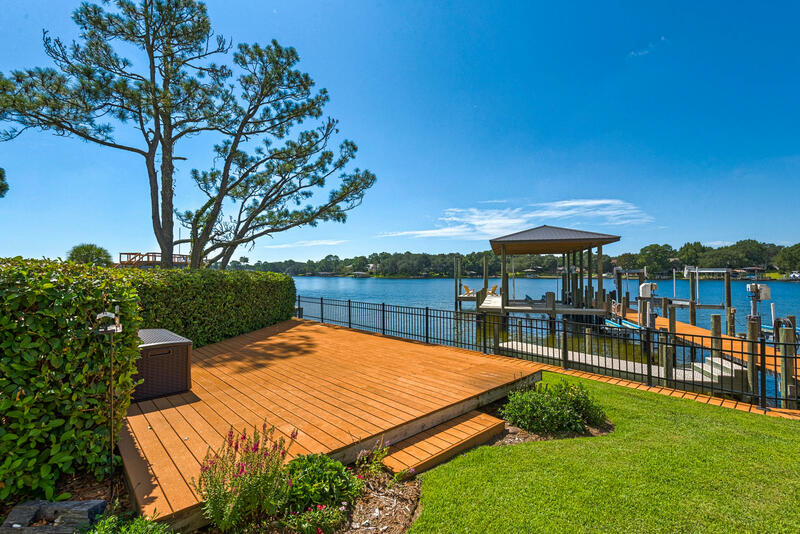 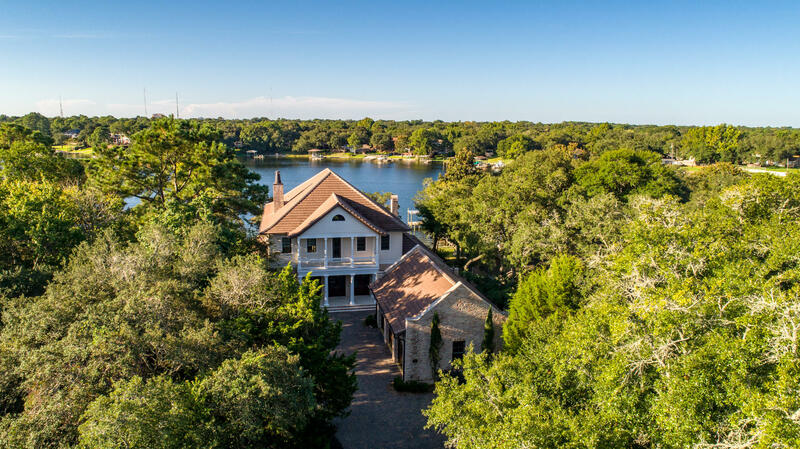 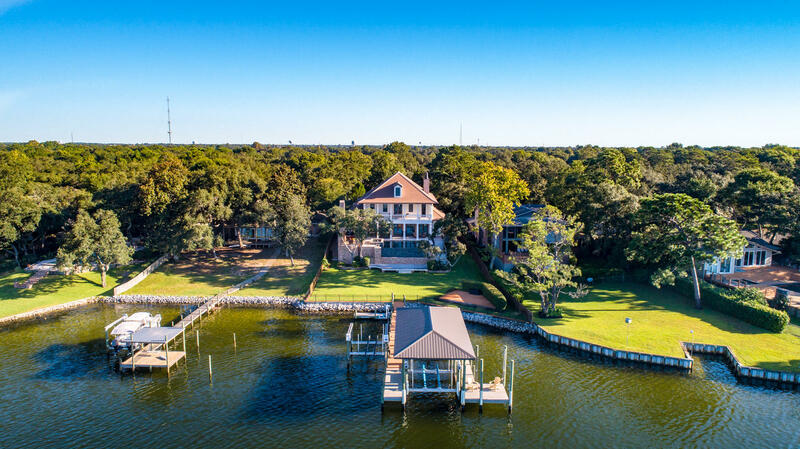 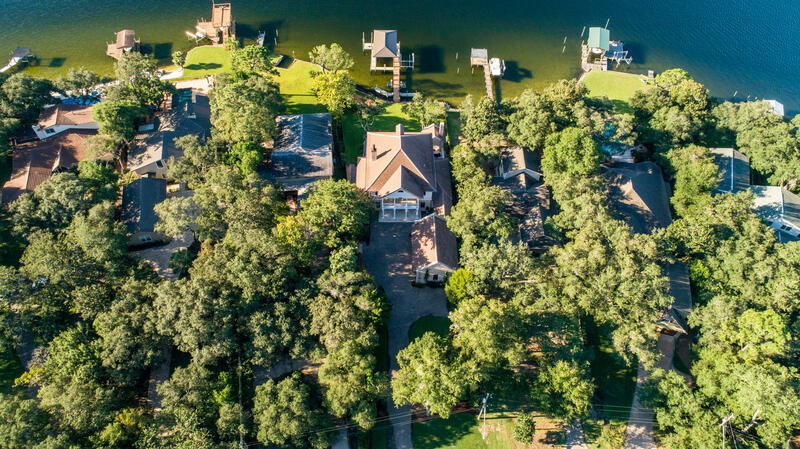 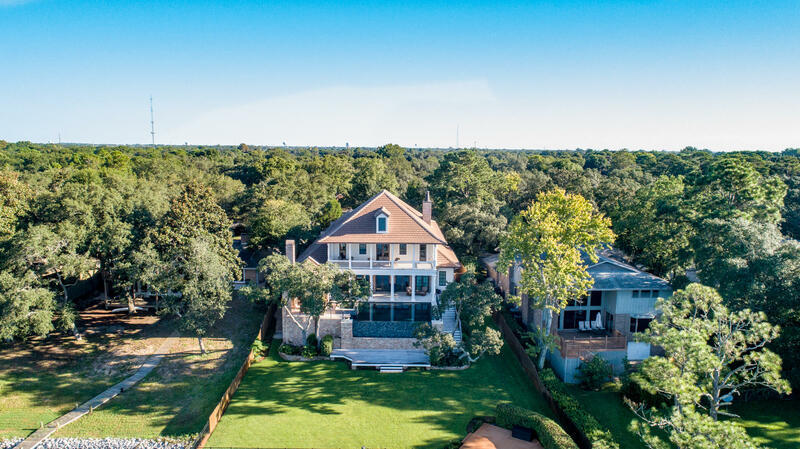 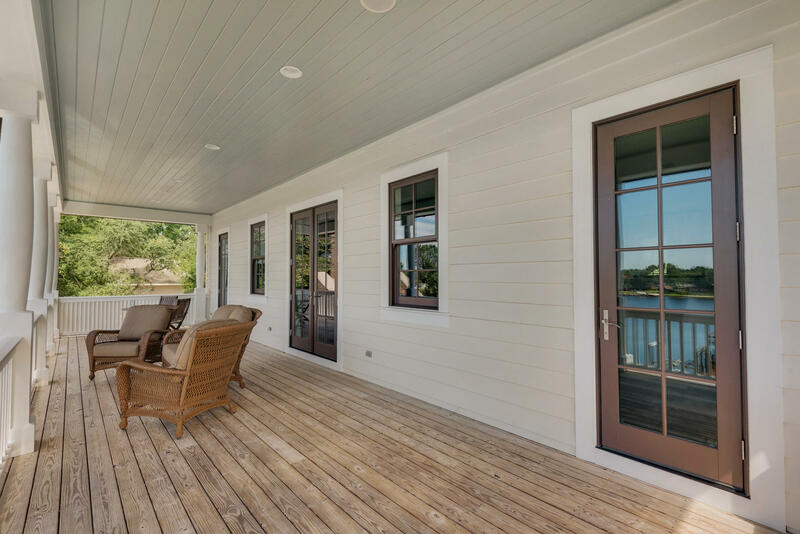 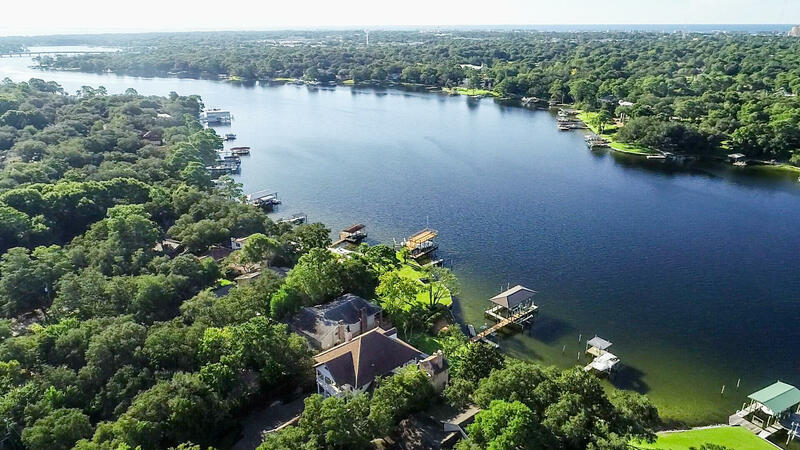 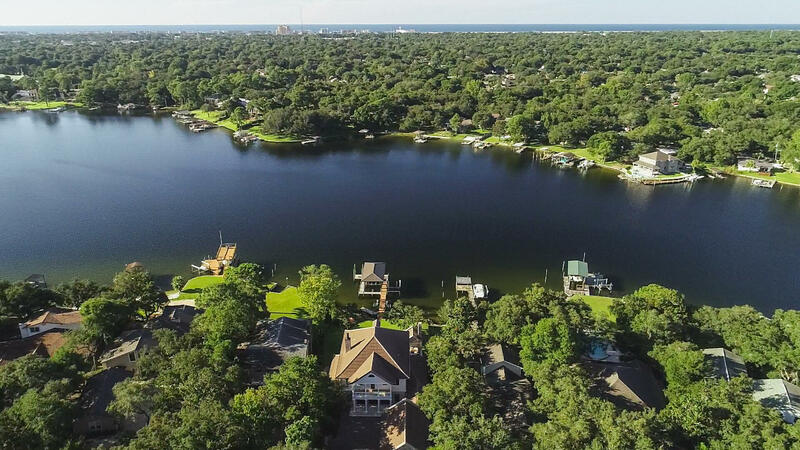 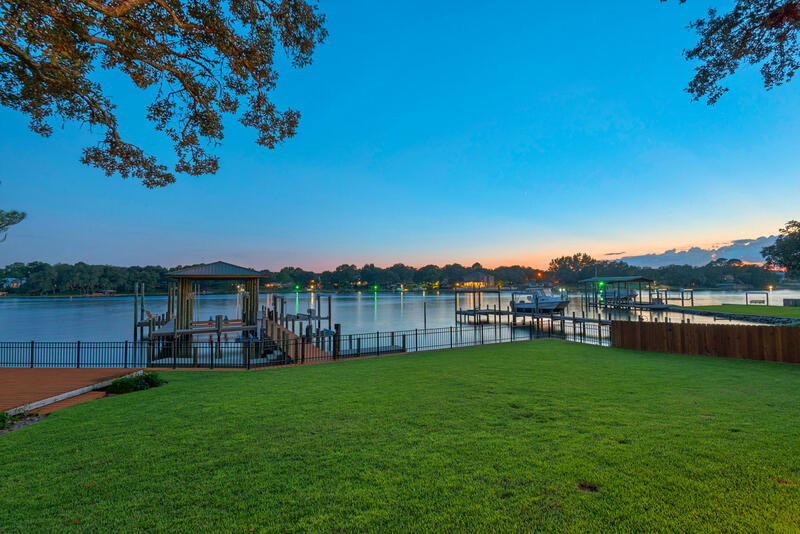 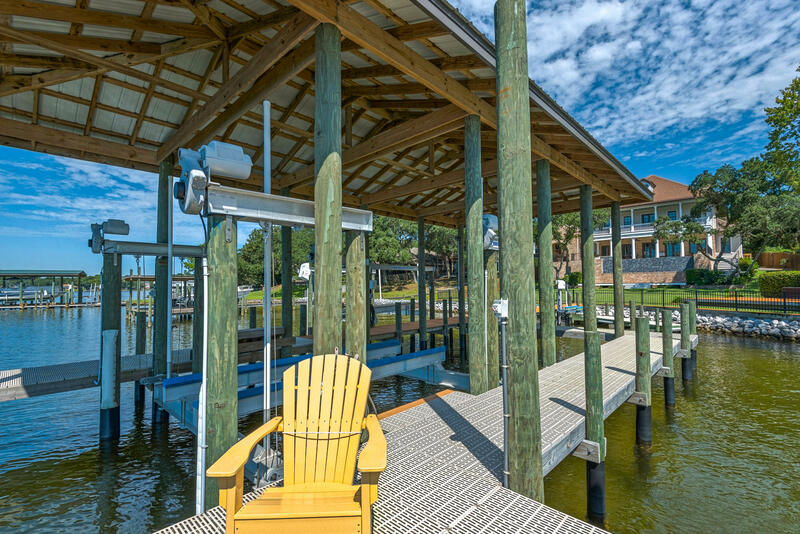 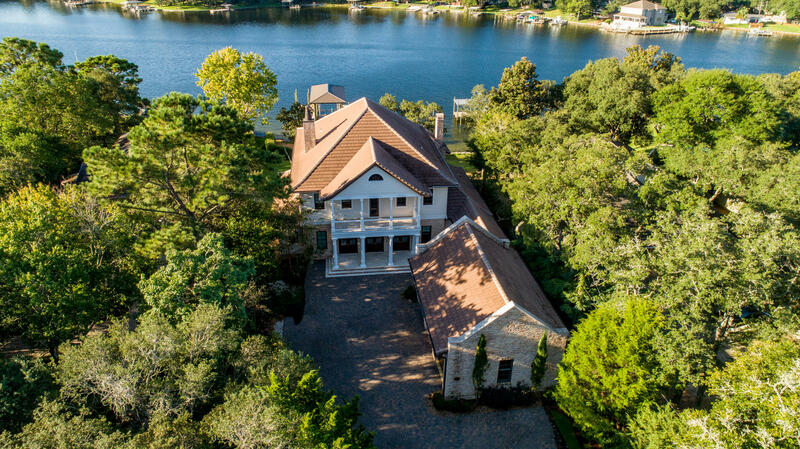 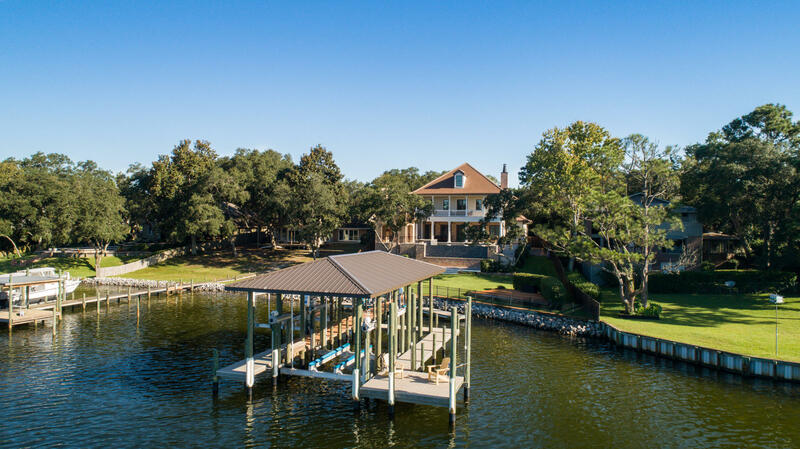 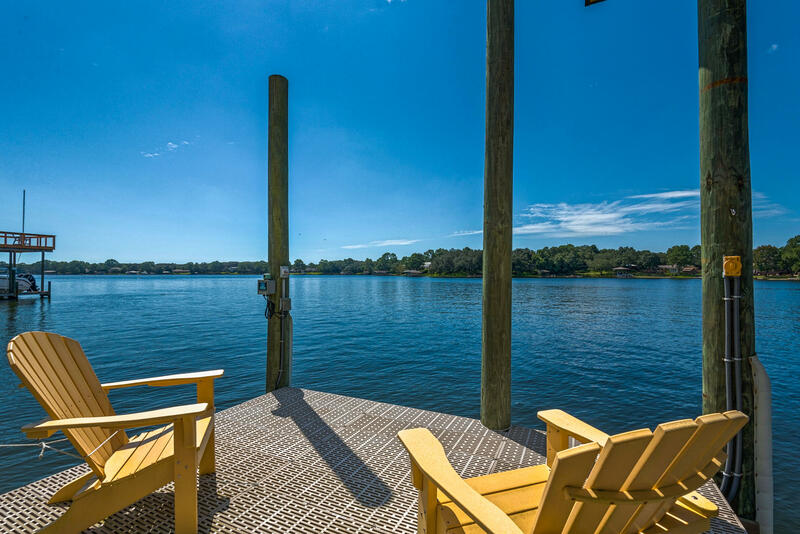 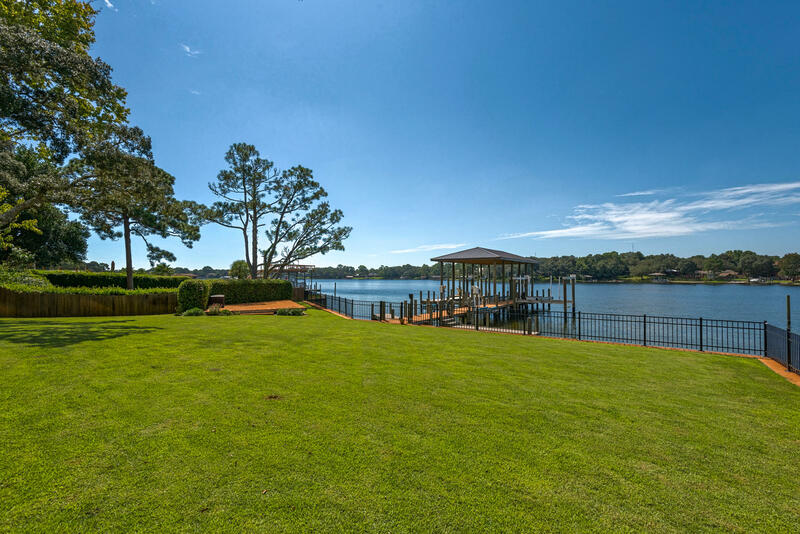 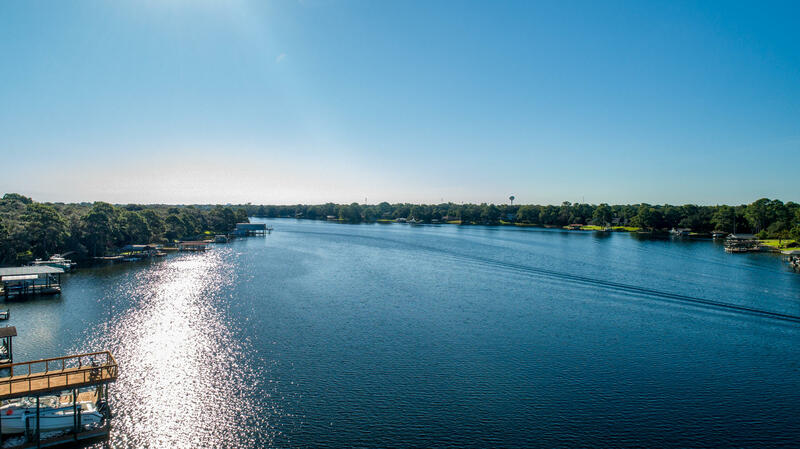 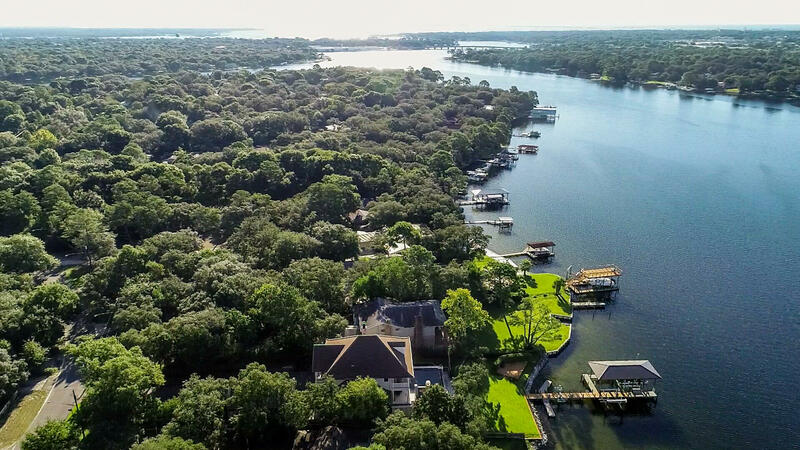 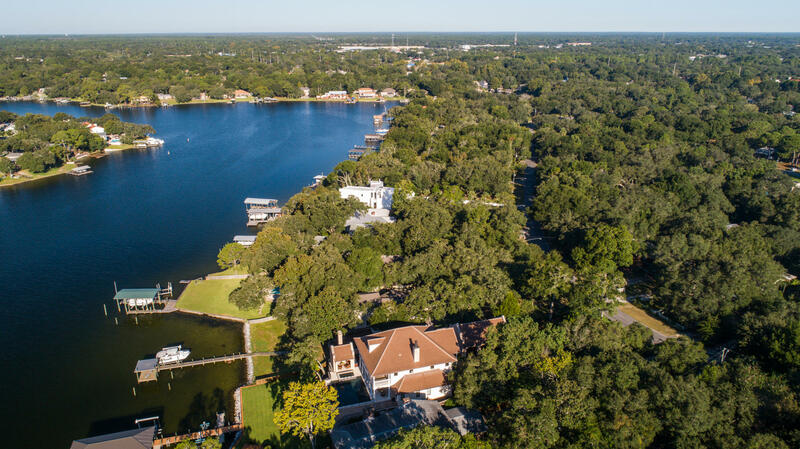 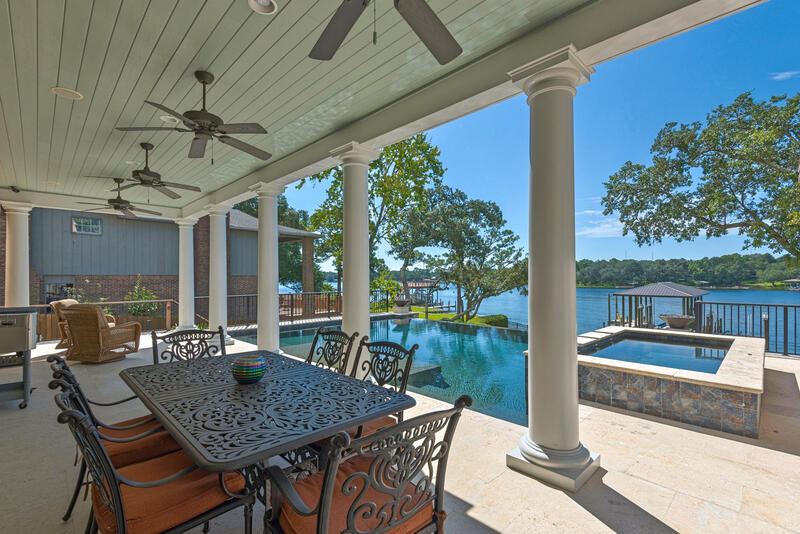 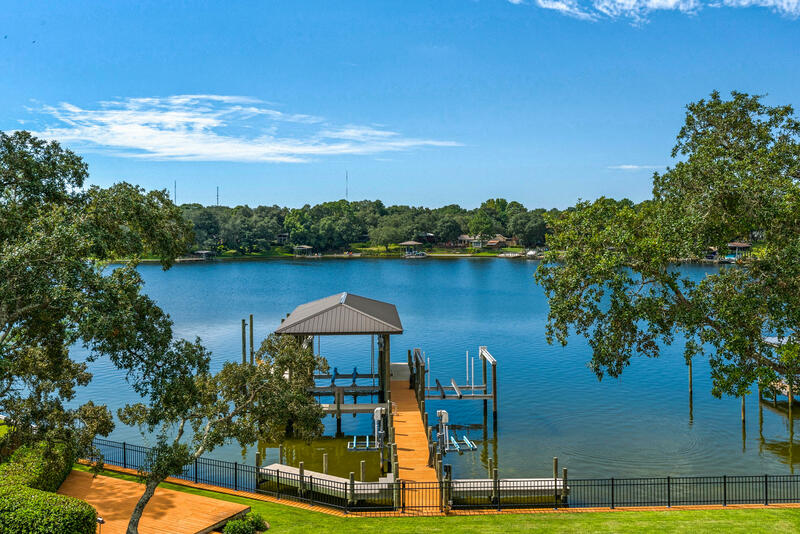 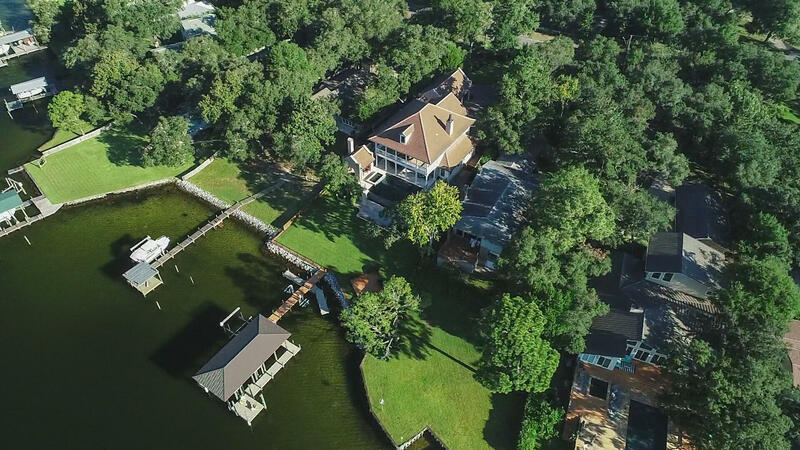 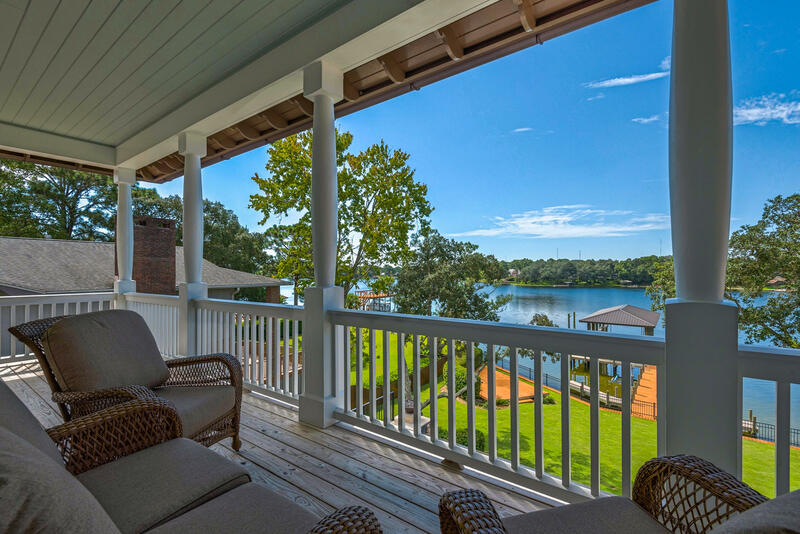 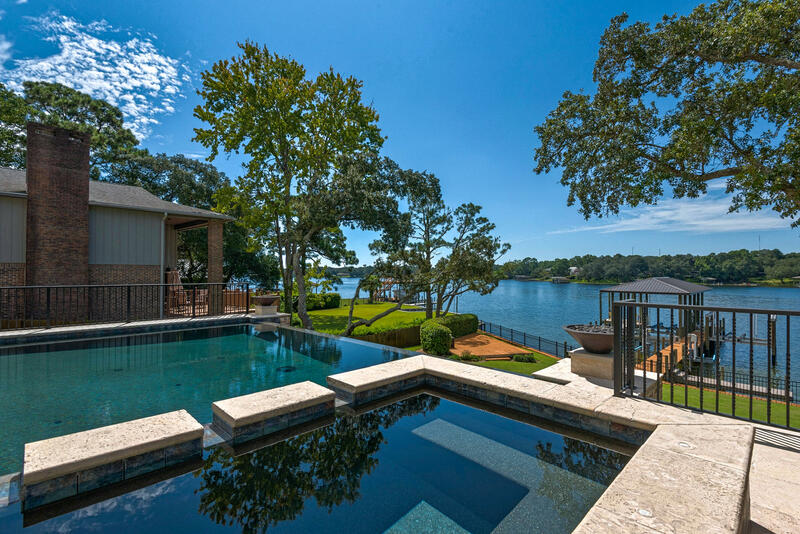 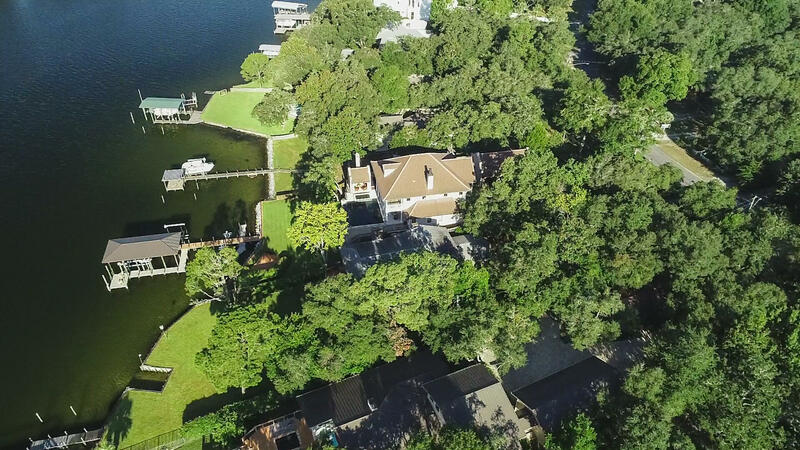 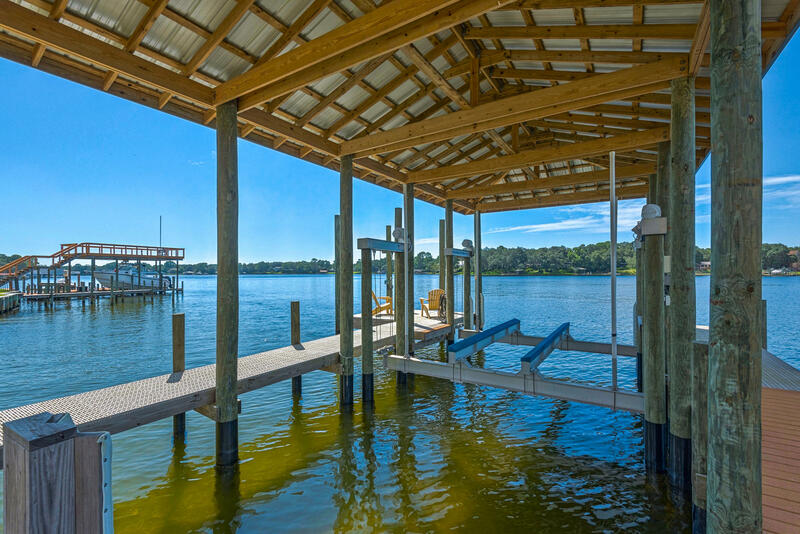 Get ready for fun on the water with your own dock complete with a covered boat house with a 20,000 lb lift, a 10,000lb boat lift, and two jet ski lifts to go out and cruise the bayous, bay or head out to Crab Island for fun in the sun. 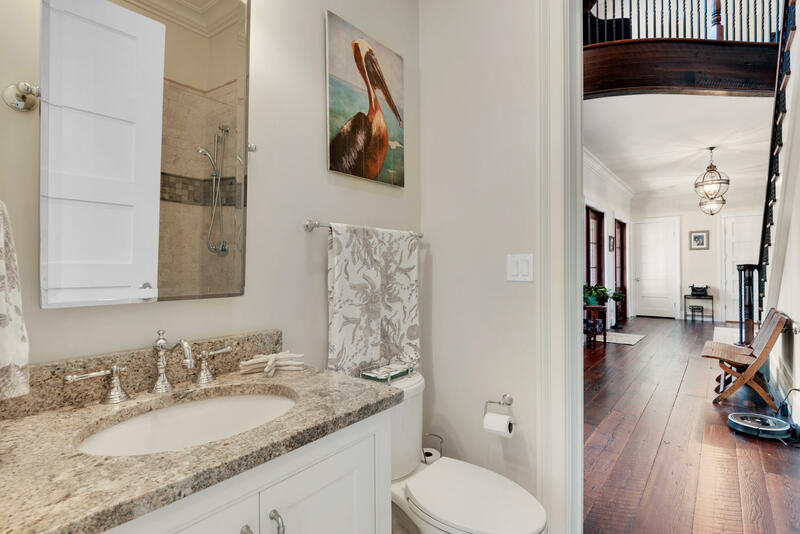 With so many custom features to list we included a feature sheet and a 3D tour. 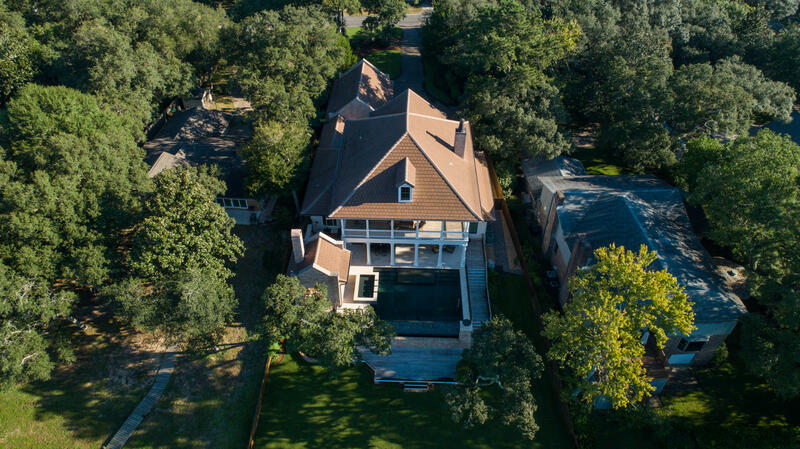 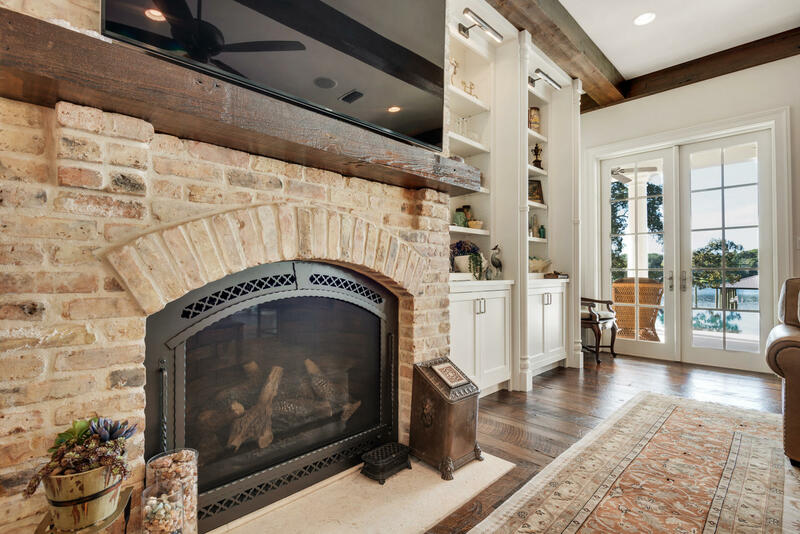 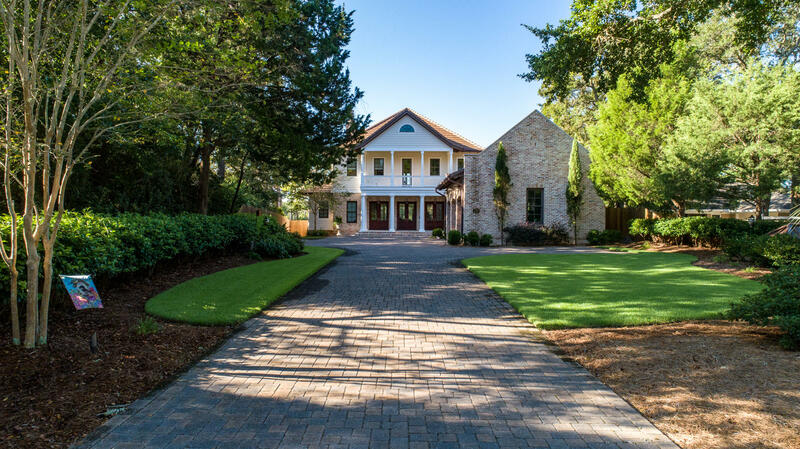 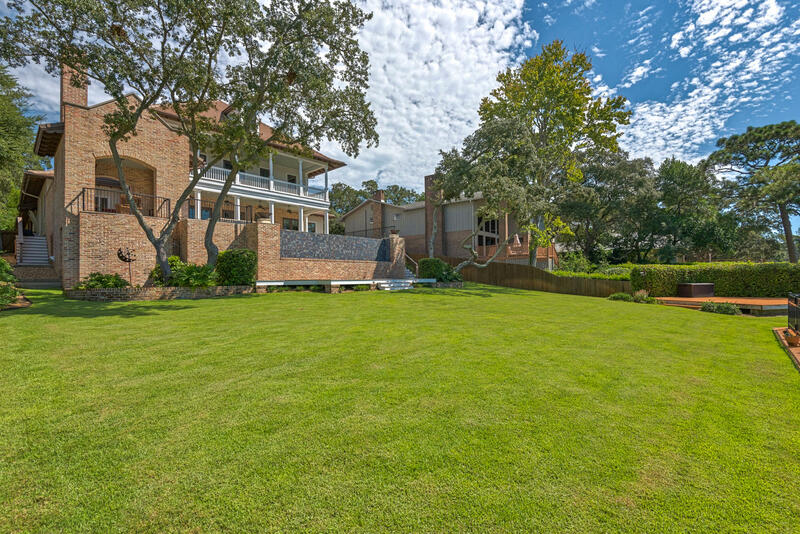 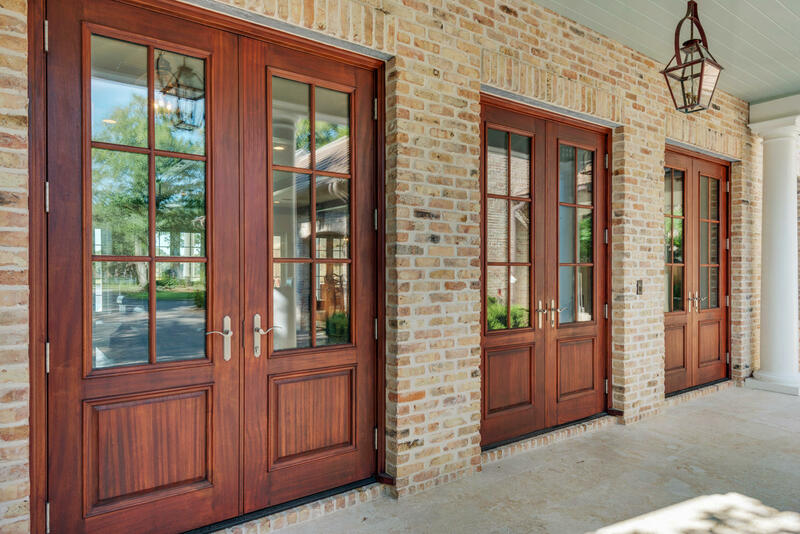 So schedule your own private viewing today!